Some of these clickable large images have been sourced from S-VHS-C videotape and will be a little fuzzy. mere means of getting from a to b. Nostalgia is very popular concept in our society. People are always looking back, as if they are trying to recall some sort of golden era when life was believed to have been better, even though for the vast majority of people this was not so. (The only possible exception to this is with food, as in ye olde days it was not adulterated with harmful chemicals or had its genetic composition dangerously compromised as is frequently the situation today). For some people Nostalgia overlaps into Heritage, much in the same way that we often look back to (for instance) Roman times to see how people lived and how that era contributed towards creating the society in which we live today. Leisure is about enjoyment, rest, relaxation, recuperation and hobbies. Often this involves transport - perhaps to travel to and through beautiful scenery which we enjoy seeing or to visit an exhibition, zoo, historic home, garden festival (etc.,) where - on larger sites - the transport sometimes also performs a useful service linking the various attractions and saving the visitors from long walks. 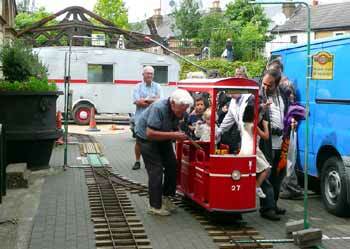 In Britain's we have many narrow gauge miniature railways. Most of these were originally built to carry freight but they now live-on by providing leisure-orientated rides to tourists - usually with the trains being hauled by historic steam locomotives - although historic diesels and (where they exist) electrics are becoming popular too. However some of these lines also provide services which meet the real transport needs of their local communities, often using diesel (and not steam) engines as these are considerably cheaper and less labour intensive to operate. One example of this is the Romney, Hythe and Dymchurch Railway (RH&DR) which runs trains taking local children to school - so instead of the more usual school bus there is the school train! 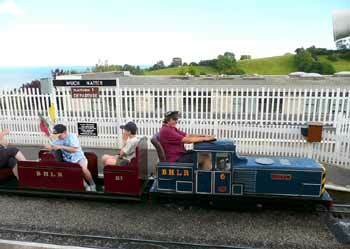 This line also operates tourist - orientated trains and this combination of local community and tourist operations points towards ways in which the leisure industry can generate income which both benefits the local economy and helps to keep the transport system financially viable. 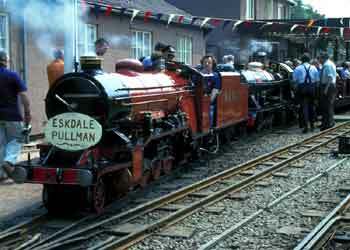 Left: Two Ravenglass And Eskdale Railway steam locomotives are about to depart with a special double-headed 'Eskdale Pullman' service. 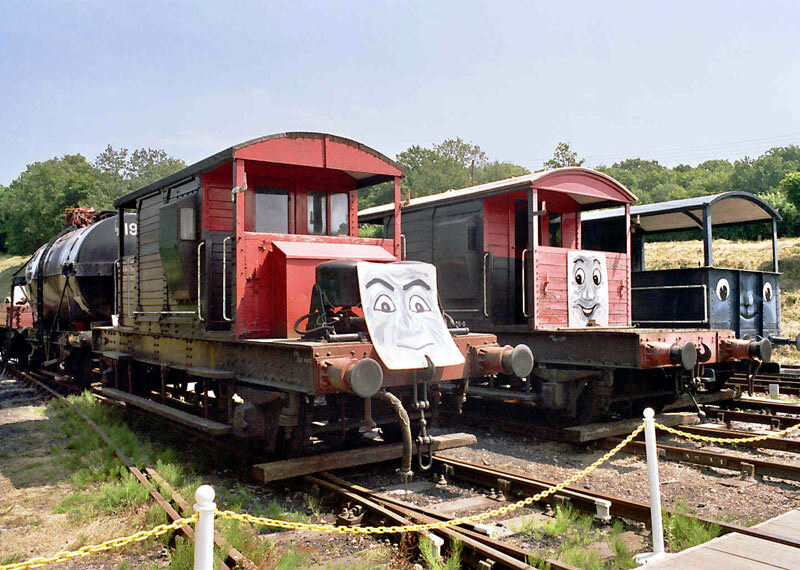 Right: These trains use real steam engines and although somewhat a tight fit the driver is just about able to get inside the locomotive's cab. For more information visit their website at http://www.ravenglass-railway.co.uk/ . A short film from this visit to the Ravenglass And Eskdale Railway has been placed on the ‘YouTube’ film / video website and can be watched at YouTube either on the right or (a version with a larger image) by clicking the link below. Diesel multiple unit train as seen on the Ravenglass And Eskdale Railway. An even smaller railway primarily aimed at giving rides to small children (and their parents, who of course are the people who really appreciate the ride!) Seen on a grassy headland at the seaside resort of Weston-Super-Mare. 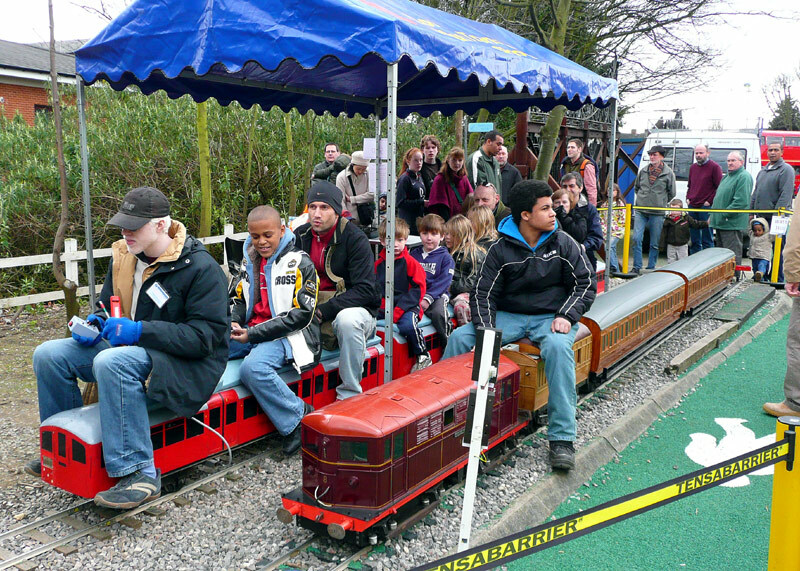 Sometimes miniature railways come in portable format so that they can be installed at locations as part of special events which typically last for just a few days, eg: a weekend. Making for a new interpretation of the advertising slogan Ride the Tube these items of miniature rolling stock are themed on a 1930's tube train and 1920's electric locomotive hauling a varnished teak milk van plus passenger carriages which date from the 1890's, when the Metropolitan was just one of the many British railway companies. The leisure-orientated 'personal ride tramcar' which being portable can be used at transport-themed events at different locations. Also aimed at children (of all ages) is the popular ‘Thomas the Tank Engine’ and the troublesome trucks! 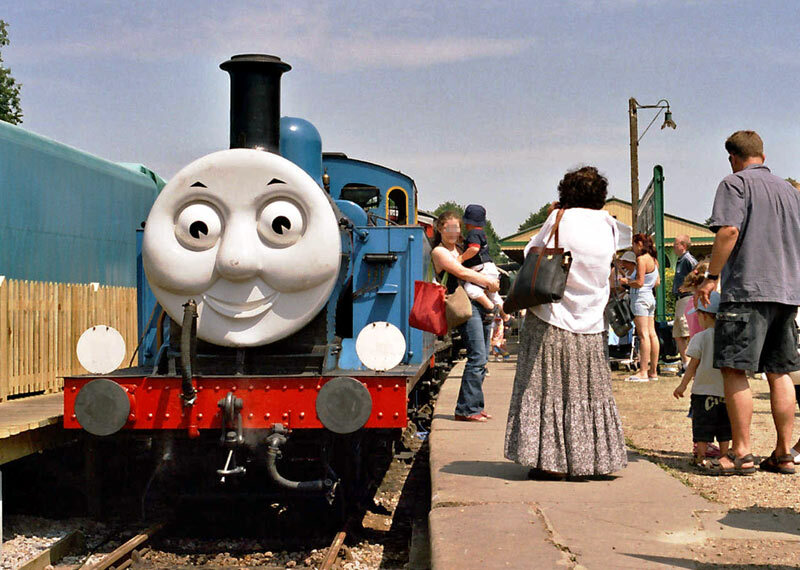 This Thomas event was held at the Bluebell Railway in summer 2003. 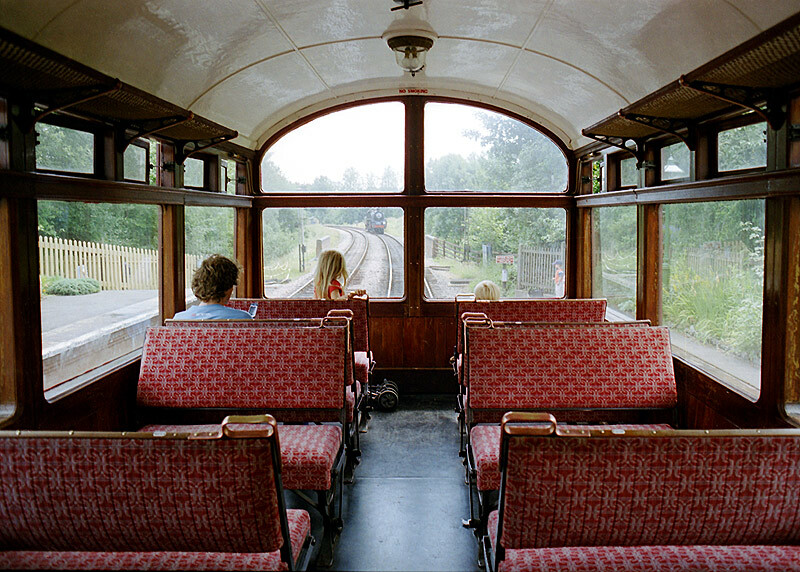 The Bluebell Railway is one of the many British Living Museums which combines leisure, nostalgia, heritage and more in one ‘package’. These museums vary in format, some are based around an historic railway station which has been lovingly restored, others offer their visitors train rides between several historic stations, and more. 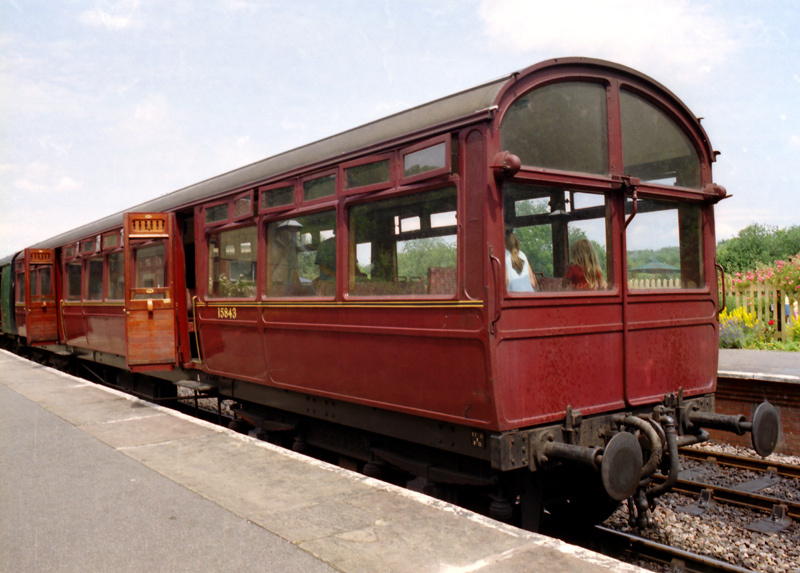 One of the most popular historic passenger coaches which the Bluebell Railway now owns is this former LNWR (London and North Western Railway) 3rd class Observation Coach No.103. Dating in 1913, three such passenger carriages were built for use on the scenic route between Llandudno and Blaenau Ffestiniog. In 1958 this one was displaced by diesel multiple unit trains, it survived because British Railways found it to be useful when training new train drivers. The seats feature double-deck tram style backs that be flipped over / reversed so that the 72 passengers can always face the direction of travel. 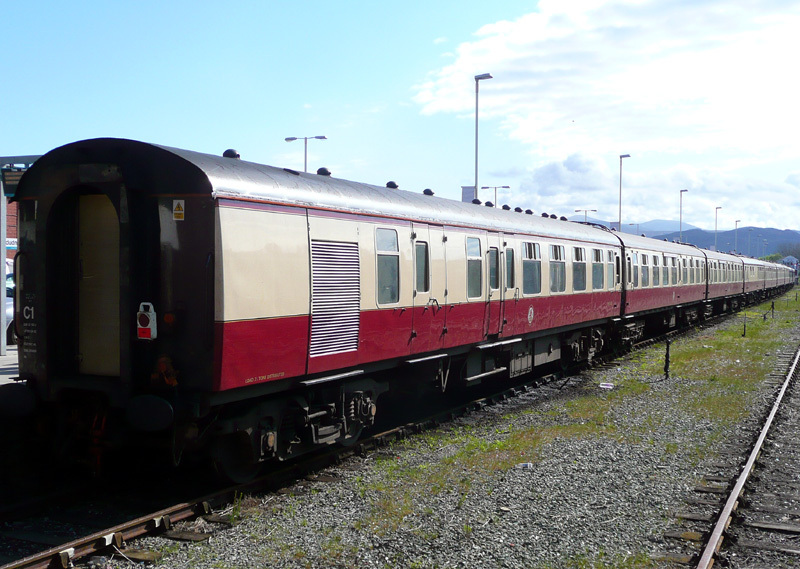 The two views which show the carriage date from 2003, when it was painted in LMS (London Midland & Scottish Railway) crimson livery and No. 5316. 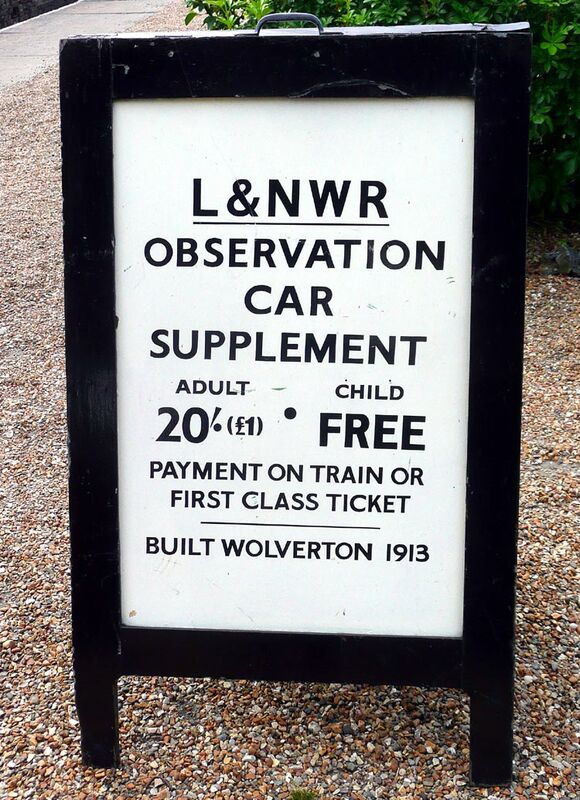 The middle view is more recent and shows that the Bluebell Railway charges a 20/- supplement for travelling in this carriage. For the benefit of readers who only know our present-day inflation prone decimal money, 20/- (20s / 20 shillings) is exactly £1 (one pound). If all this sounds complicated then be pleased they don't charge a guinea - which was 21 shillings or £1.05 in decimal. There are also some companies which specialise in operating leisure-themed day trips by historic railway coaches. 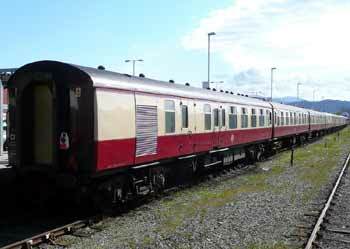 The Mk1 passenger coaches seen here at Llandudno in North Wales are in the former British Railways ‘crimson and cream’ livery. 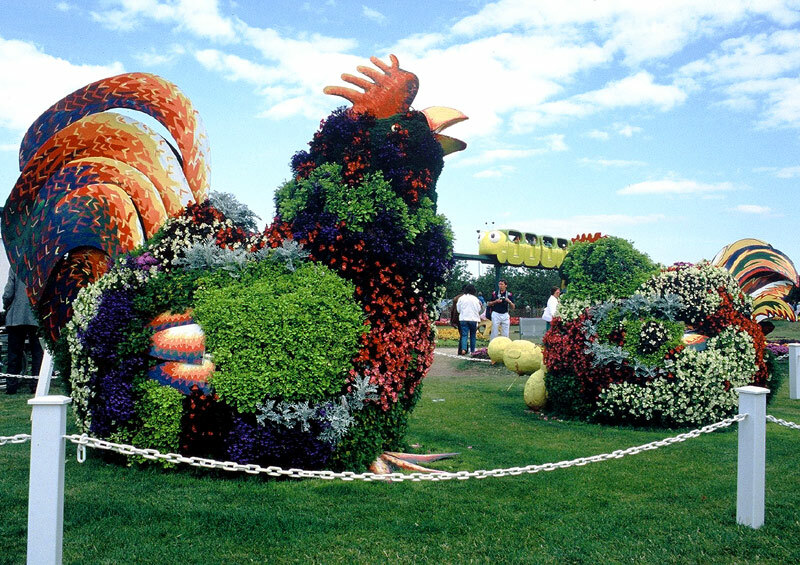 In the 1980's and early 1990's several British cities hosted a series of bi-annual garden festivals which were open for 6 months at a time. Most were on large sites with ‘fixed infrastructure’ transport facilities to help the visitors explore part or all of the sites. These examples come from Liverpool, Glasgow and Gateshead. 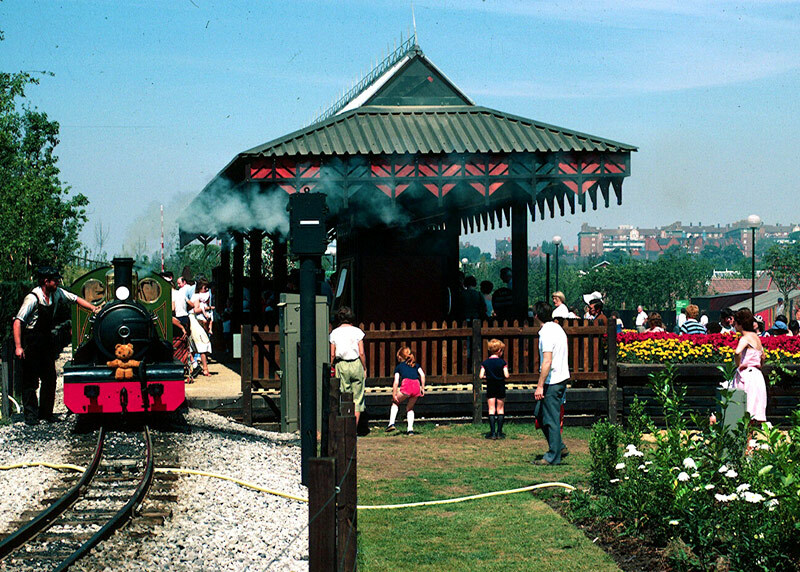 Making a ‘station stop’ (modern terminology to differentiate from stopping elsewhere along the line) at the 1984 Liverpool Garden Festival. 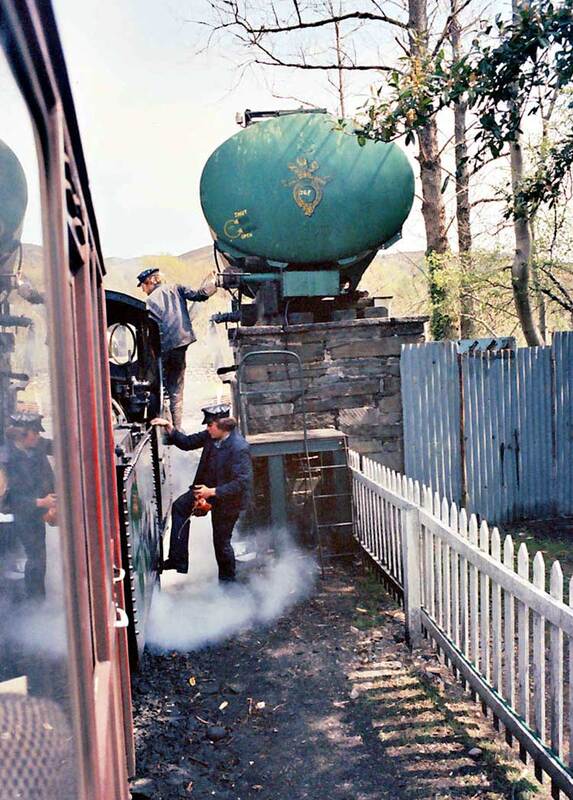 A train driver and platform attendant chat whilst awaiting the departure time at the 1984 Liverpool Garden Festival. Several films from these Garden Festivals have been placed on the ‘YouTube’ film / video website and can be watched either above or (larger versions) at YouTube by clicking the links below. Both films comprise silent super 8 ciné film, 35mm slides and music from the Incompetech Silent Film Royalty Free collection. The Glasgow tram system closed in 1962 but for six months in summer 1986 one returned to passenger service in its home city at the Glasgow Garden Festival - to much public acclaim! The Glasgow Garden Festival also used a preserved tramcar from the Scottish capital, Edinburgh and an open top decker from Paisley (not illustrated). 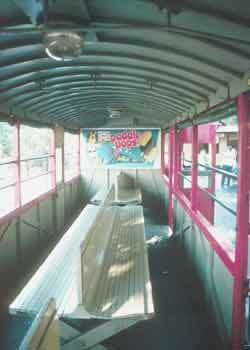 Monorails are sometimes also used at Garden Festivals - this example comes from the 1990 Gateshead Garden Festival. There was also a tramway here (not illustrated). This view comes from EXPO86 which was in Vancouver, Canada (in 1986). 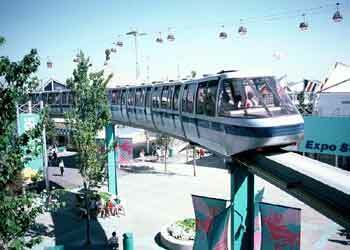 After the exhibition closed the monorail system was dismantled and sold to Alton Towers (in England) where it still operates today. 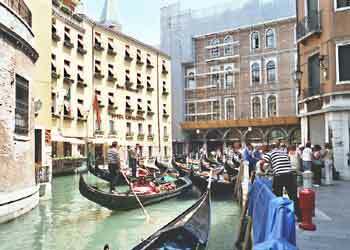 In the background can be seen some hanging gondolas - these are looked at in greater detail on the Cable Transports page. 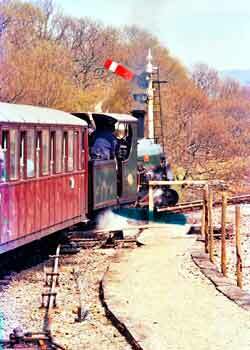 North Wales is famous for its narrow-gauge railways, one of the most well known being the Ffestiniog Railway (Rheilffordd Ffestiniog in the Welsh language) which claims to be the oldest independent railway company anywhere globally. 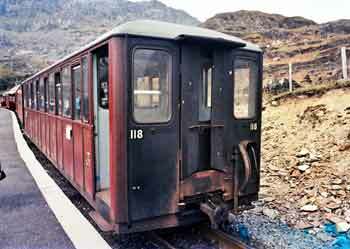 Originally built to carry slate it now carries passengers through the spectacular scenery of the Snowdonia National Park, between Porthmadog and Blaenau Ffestiniog. 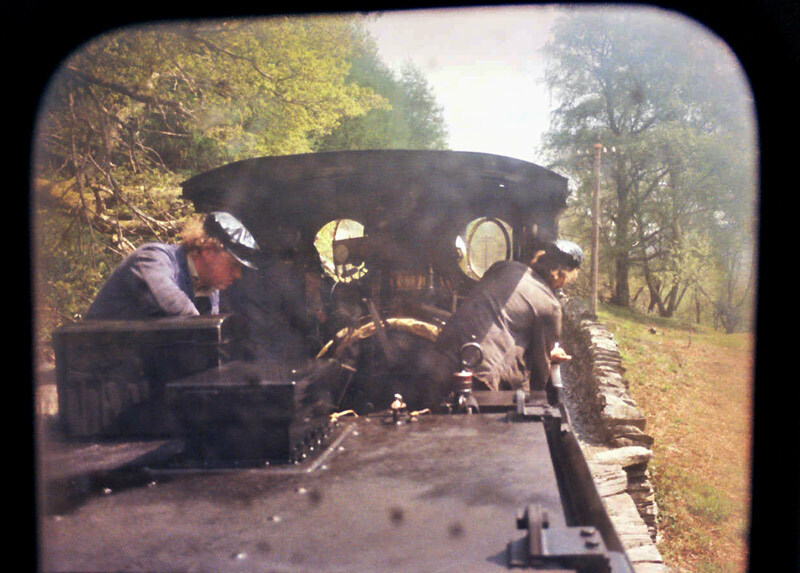 A view of front of the train as seen by leaning out a carriage window. A thirsty steam locomotive gets a drink during a station stop. 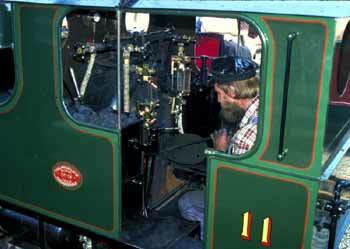 A view of the locomotive footplate as seen from an end windows on the carriage immediately behind the locomotive. 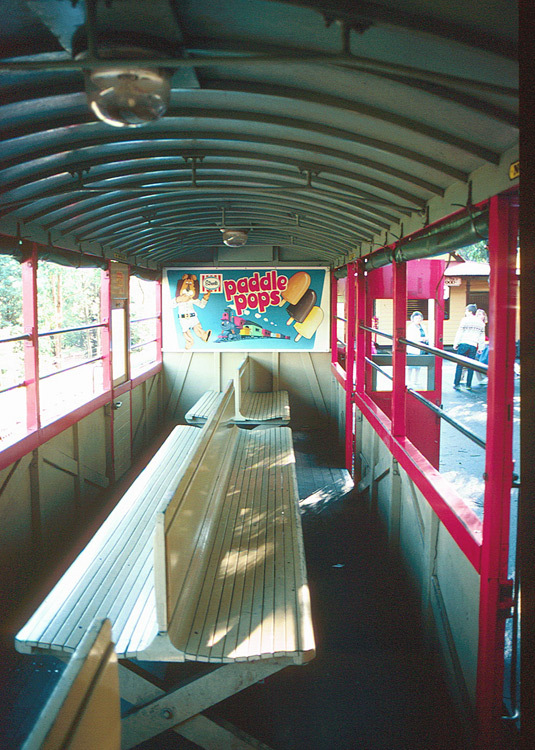 Some of the carriages have end doors so passengers can walk through the train. 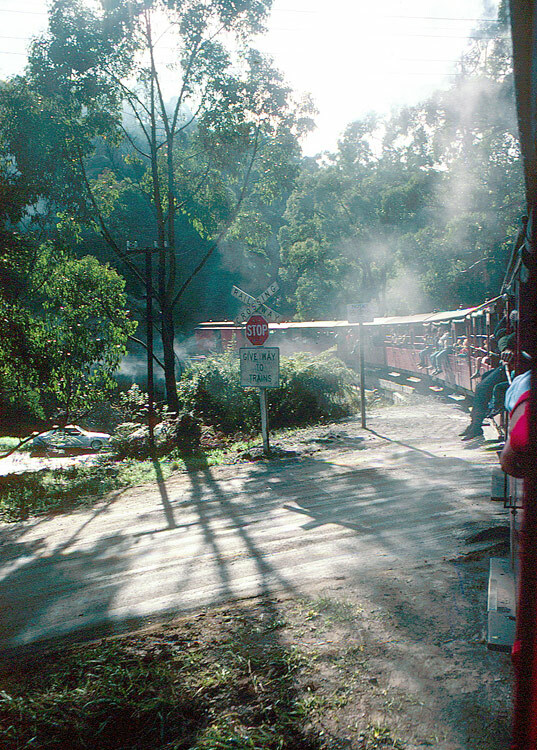 Leisure-orientated rail services is not just a British phenomena, the views below were sourced from the "Puffing Billy" rail line near to Melbourne, Australia. 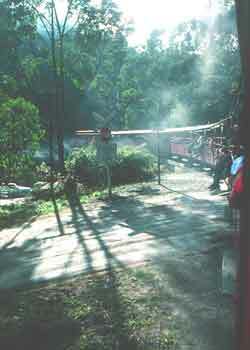 This pioneering railway was first built to open the bush to european settlement, later part of its route was incorporated into the local urban rail system (which uses fullsize electric trains) whilst the rest offers pleasure rides, as here. Note the rather spartan carriage with the double-sided bench seating down the centre (and no emergency alarm system) and how children often sit in the windows - with their legs dangling on the outside. For more information visit their website at http://www.puffingbilly.com.au . Here in Britain there are several leisure-themed tramways that use historic (or historic looking) trams which are not just there for nostalgic purposes but also because they actually provide useful transport functions. 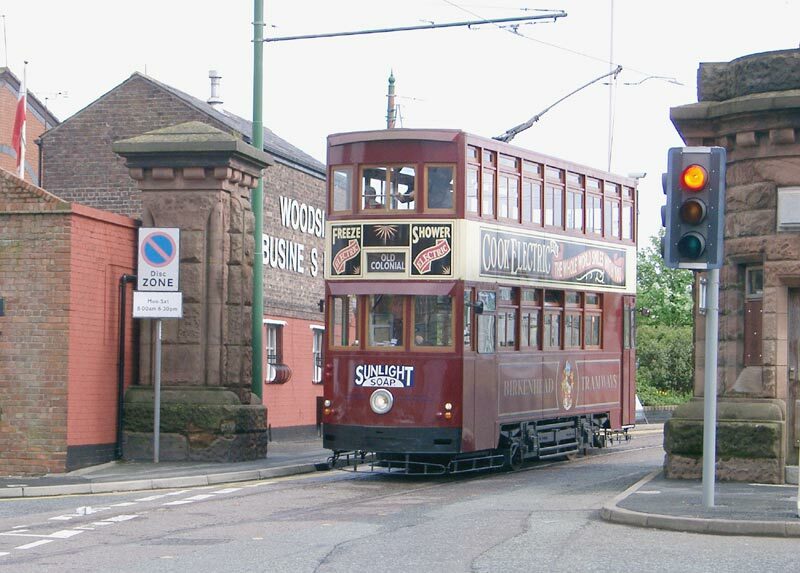 One such example is the Wirral Tramway which links the Woodside Visitor Centre (one of the locations from where the famous Mersey Ferry operates) to The Wirral Transport Museum. The Wirral is on the other side of the River Mersey from the city of Liverpool. 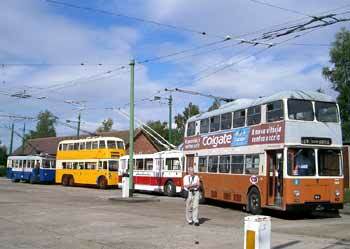 The Wirral Transport Museum houses one of the most comprehensive collections of old vehicles in the UK. 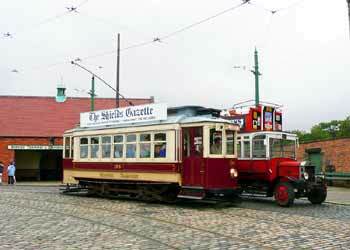 In addition to the restored local trams and motorbuses, it also houses numerous other vintage and classic vehicles including cars, motorbikes, mopeds, cycles and a fire engine. 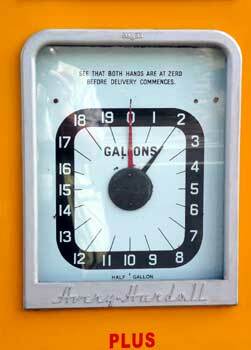 In addition there is a reconstructed 1930s garage scene and various other transport-related static exhibits. There is also a large model railway layout. (Displays are constantly changing and developing). Birkenhead is the historic home of Britain's (and indeed Europe's) first street tramway. 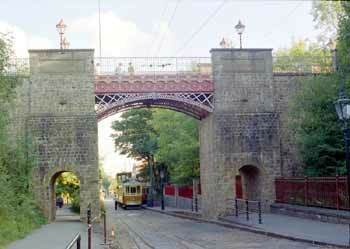 Opening on 29th August 1860 it featured horse drawn trams running from Woodside to Birkenhead Park. The present day line however opened in 1995 and services include genuine Hong Kong trams as well as (sometimes) vehicles from the fleet of restored trams, including the open-topped 1901 Birkenhead tram 20, the 1920 Wallasey tram 78 or the 1931 Liverpool tram 762. 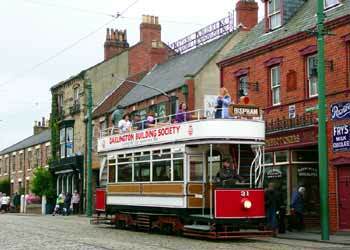 Many of these trams are owned by The Merseyside Tramway Preservation Society (MTPS). 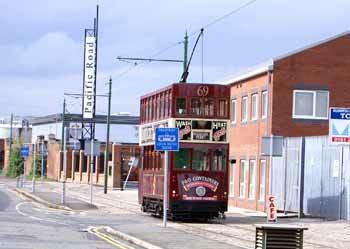 The tramway is part of a docklands regeneration area - and it can be very easily reached from the historic Hamilton Square Merseyrail station (local suburban mainline railway) as well as local buses and by car. Being a standard gauge tramway it was possible to use this line (in February 2005) to test a prototype British-built modern articulated tram, prior to being transferred to Blackpool for more extensive testing. Although most of the Birkenhead Tramway operates along its own private right-of-way (note the modern-era signage where the line crosses off-street entrances) it includes some street running too. For safety - especially as it involves some contra-flow running - this location is traffic signal controlled. To prevent abuse the traffic signals are operated by the tram driver using a special key (not shown). In Britain we also have several large living museums where the trams (and buses / trolleybuses) are used as 'serious' transports helping carry people around extensive sites which primarily look at how people lived in days gone by. In this way they have become useful extras that enhance the visitor experience, but not the main attractions. These include the Black Country Living Museum (BCLM) in Dudley (near Birmingham) and Beamish North of England Open Air Museum in Co. Durham (near to Newcastle Upon Tyne and Durham). 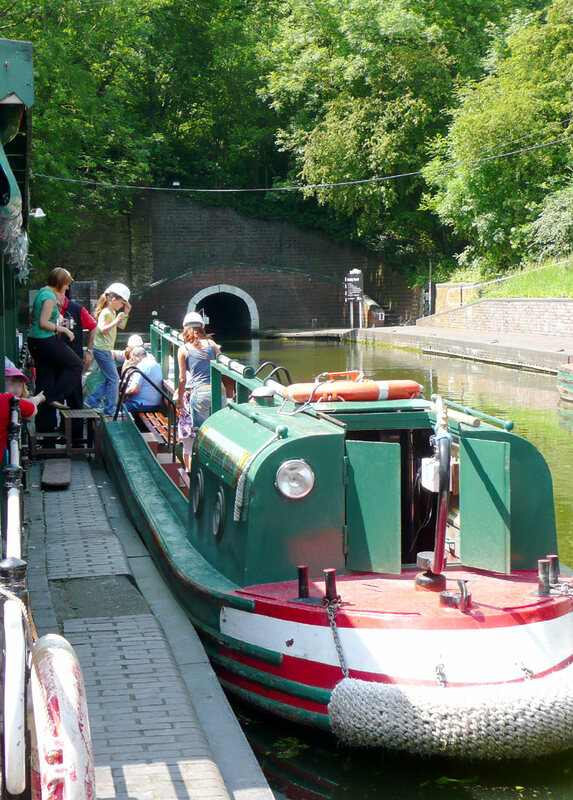 Adjacent to the BCLM is the Dudley Canal Trust which offers visitors the chance to enjoy fascinating journeys through the (mostly subterranean) Dudley Canal Tunnels and Limestone Mines on electrically powered narrow boats. 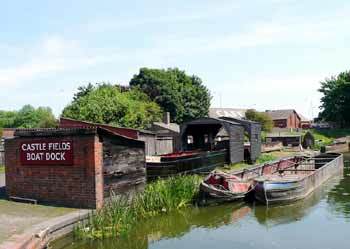 Note that this is a separate visitor attraction and narrow boat rides are paid for separately. 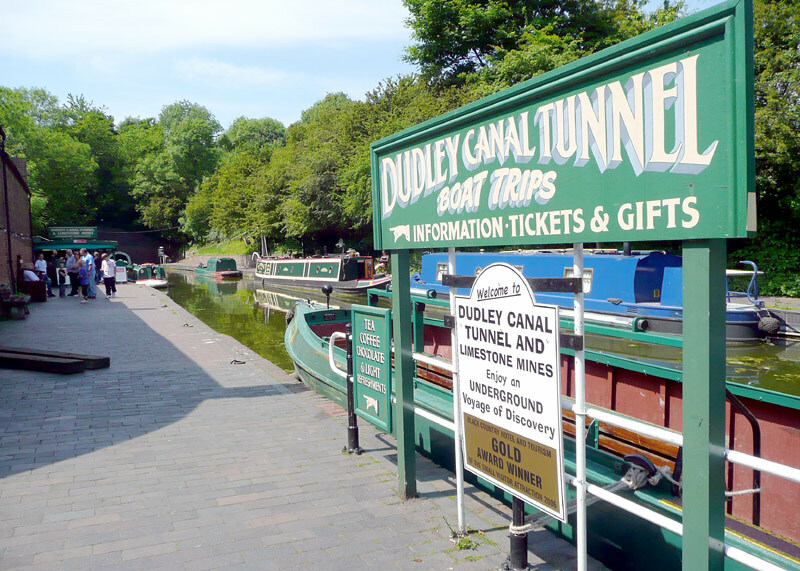 Although easily reached from within the BCLM the Dudley Canal Trust also has its own street entrance, so it is not necessary to visit the BCLM at the same time. 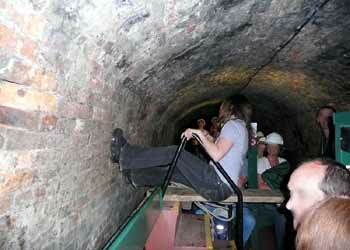 The Dudley canal tunnels are looked at in greater detail further down this page. 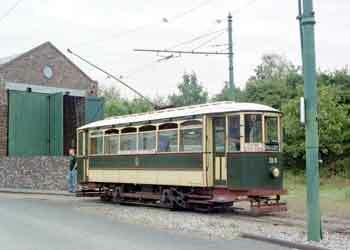 Former Wolverhampton tram No.34 at the Black Country Living Museum. 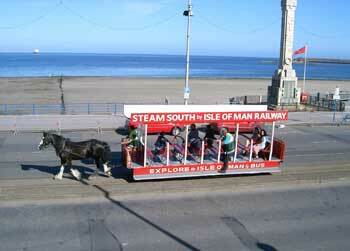 Here the tramway operates a point to point service with just a couple of stops. Ex-Walsall trolleybus No.862 makes easy work of an uphill section of road at the Black Country Living Museum. 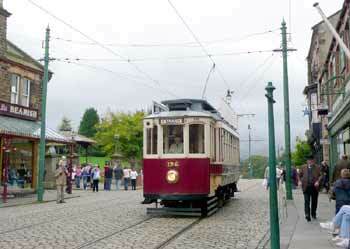 The Beamish tramway opened in 1973 and has been extended in stages to its current size. In the process it has incorporated some of the railway line, which therefore now consists of two separate sections and become a 'static' display. However there is another railway which uses replica vehicles such as existed in 1825 and this line still gives working demonstrations. 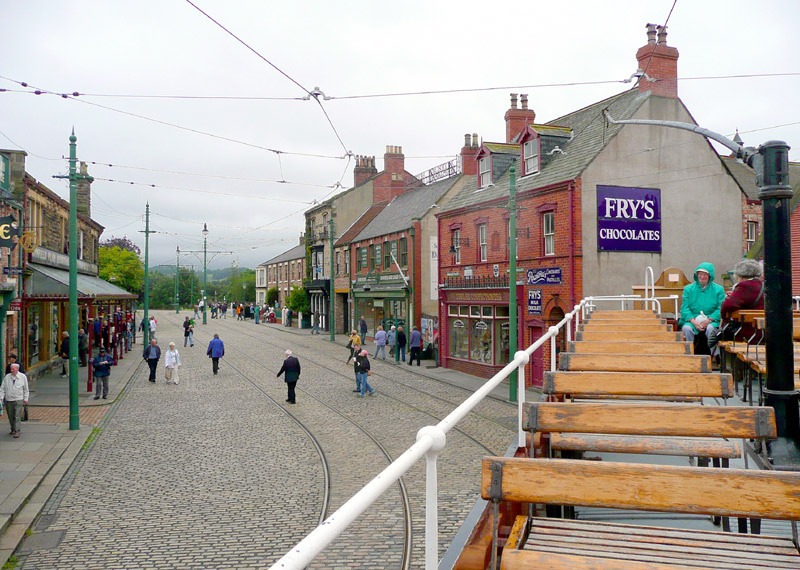 The tramway is approximately 1½ miles in length, features four tramstops, three passing loops plus in the recreated town centre there is a section of double track. 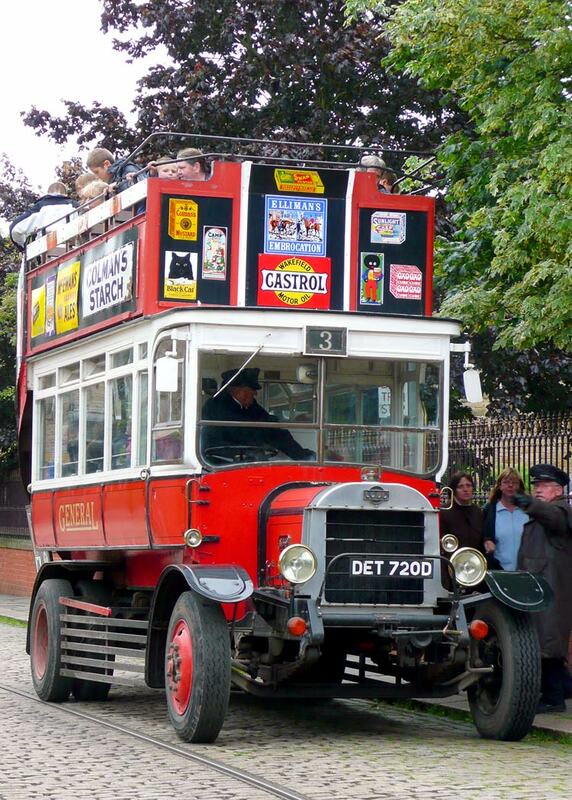 During the summer season a replica vintage motor bus service carries visitors between The Town and The Colliery Village. 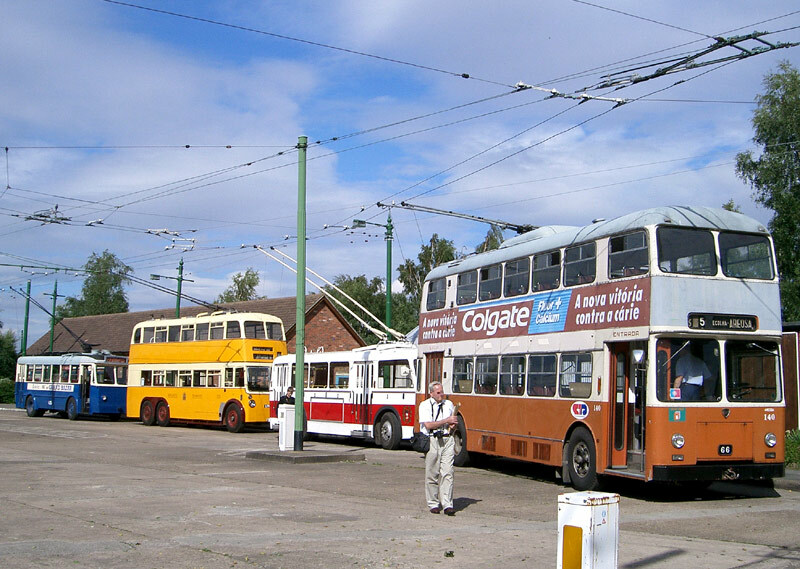 One of the buses is a copy of a double-deck bus owned by Gateshead Tramways in 1913 and the other is a copy of a London General double-deck bus which dates from the same era. 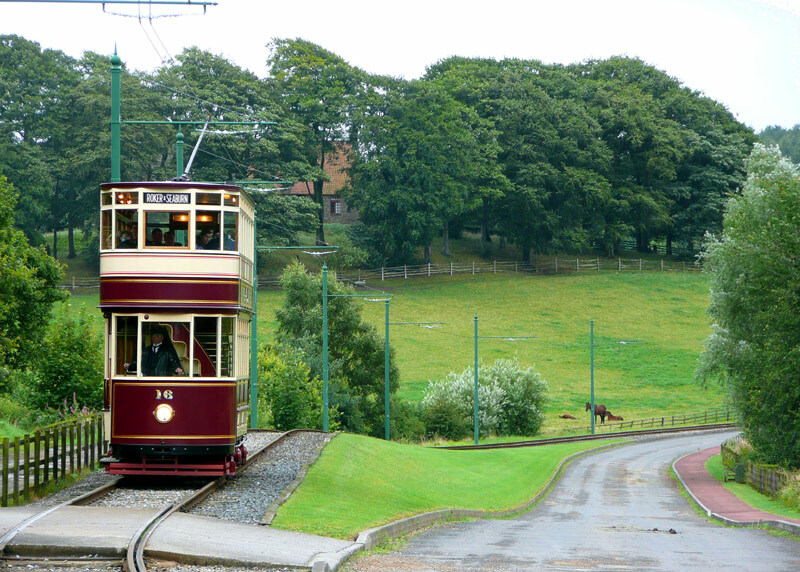 Although there is also some trolleybus wiring at Beamish it is rarely used - this is because their only working trolleybus dates from 1948, so is from the wrong time period for a living museum where the exhibits represent life in 1825 or 1913. However, in 2014 it was announced that Beamish had won a major Heritage Lottery Fund grant which will allow it to create a 1950's era themed area which will be served by trolleybuses. The wiring is expected to be about 1½ miles in length and follow the main route around the site - except for a deviation away from the 1913 area to the 1950's area instead. 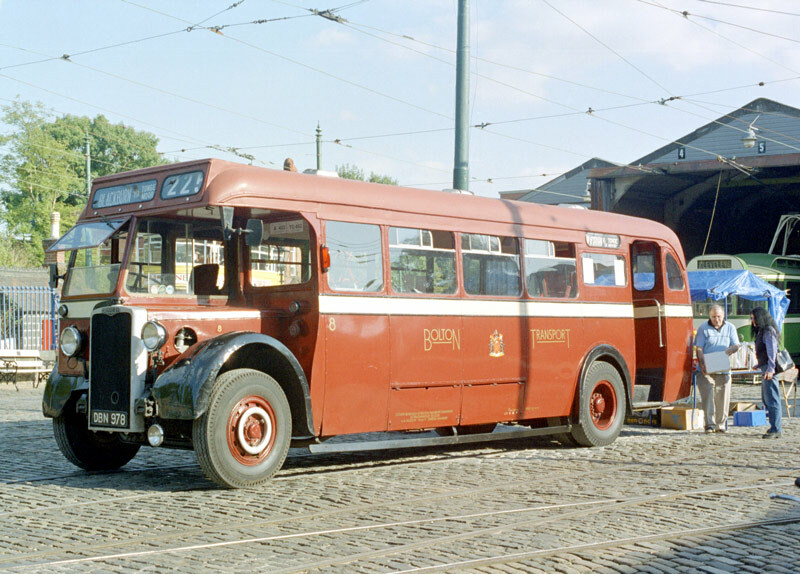 Ideally Beamish would like three trolleybuses and they also aim to have two diesel buses from the same era as although these will not be used daily they will add extra capacity at busy times. The trolleybuses might be introduced to service before the area is ready for visitors, with them offering rides through the construction area so that visitors can see what is being built without being allowed to alight. 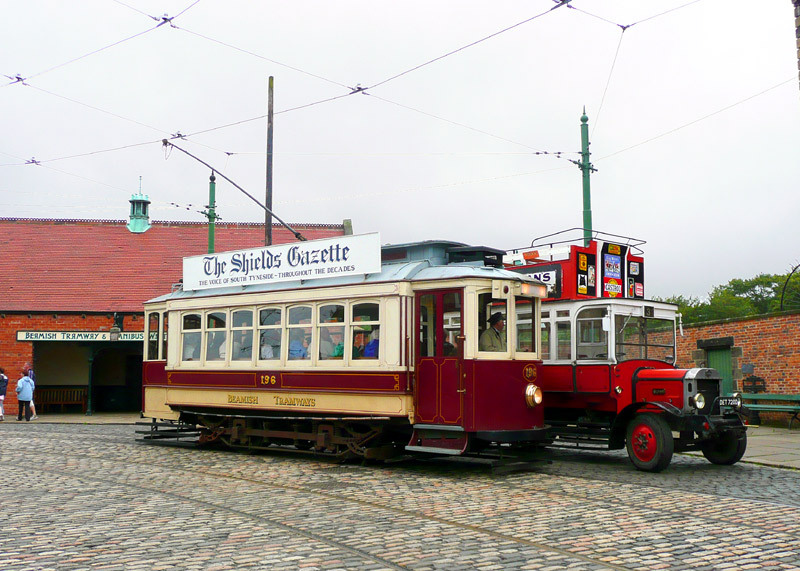 Left: Representing the second-largest tramway undertaking in the North East (of England) former Sunderland Corporation tram No.16 (which dates from 1900 but has been restored to its 1920s enclosed double-deck condition) travels through one of the undeveloped sections such as link the entrance with the themed exhibits. 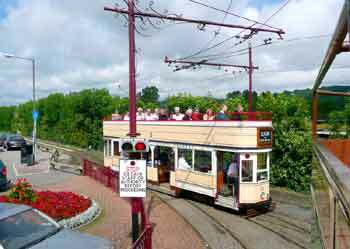 Right: A view from the top deck of an open top tram at one of the passing loops as former Sunderland Corporation tram No.16 passes by. 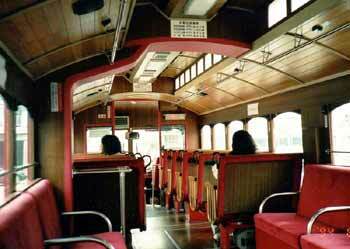 The open-platform, open-top double deck former Blackpool tram No. 31 (which has been restored to its 1920s condition) slowly travels through the town centre. An overview of the town centre, as seen from the upper deck of Blackpool No. 31 whilst awaiting its correct departure time from the tram stop. Note the passenger wearing 'rainy weather' clothing! Tram 196 is a small 4-wheel single decker, built in 1935 at the Boavista Works of Companhia Carris de Ferro do Porto (The Oporto, Portugal, Tramways Company) to an American design dating from 1909. It has been converted to become a totally-enclosed tramcar, primarily for off-season operation so that it can be used in the winter - although it is seen here in the recreated 1913 town centre on a wet so called summer's afternoon. In the background in the view on the left can be seen the park, where in summer a brass band located in a bandstand entertains visitors by playing pieces of music. 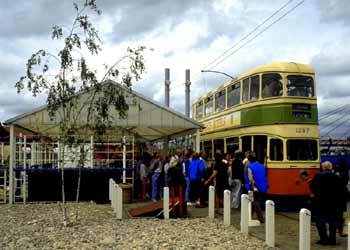 The view on the right includes the replica London motor bus and the tram & omnibus stop passenger shelter. 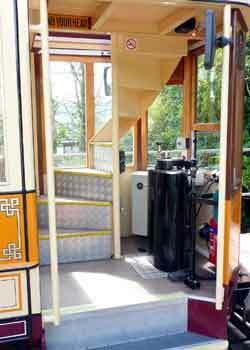 More views of the replica London motor bus. Note the open rear staircase and plethora of advertisements. Beamish also has some trolleybus wiring but their vehicle is too modern for the time periods they are recreating, and the wiring does not reach the town centre. Included in the many other transport related attractions at Beamish are a signal box, a 1867 railway station and goods yard; these are looked at on the Nostalgia page (not all the transport - related attractions at Beamish are illustrated). 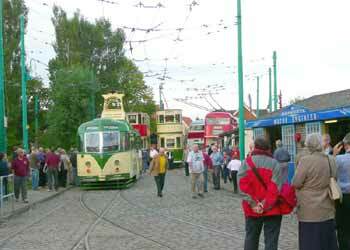 The National Tramway Museum at Crich looks at Britain of the 1950's, when many tram systems were being closed. Built in a former quarry it too has relocated many 'streetscene' structures and even complete buildings from around the country to its site. However, here the main focus is the trams themselves. 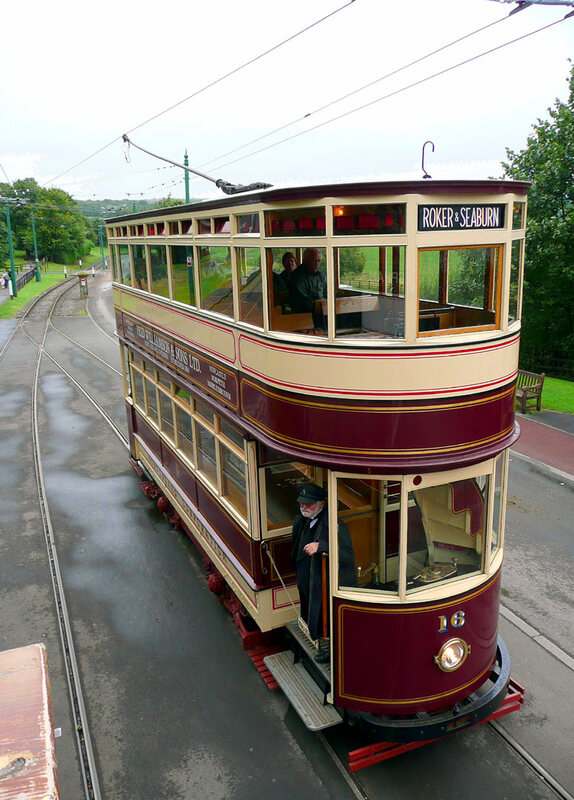 This includes giving passengers the opportunity to sample travelling on a large fleet of preserved trams which primarily come from many towns and cities around Britain. Left: (two images) The Victorian archway provides an ideal vantage point for photography, as well as helping split the site visually (making it seem larger than it is) plus creating a pinch point where the system's creators decided to demonstrate the use of interlaced track. 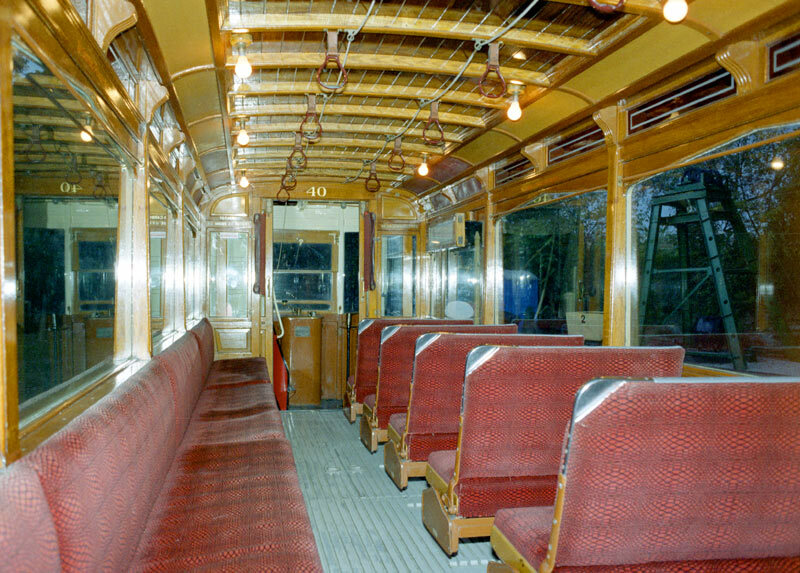 Right: Inside one of Crich's single deck trams showing how to maximise seating capacity in a limited space it features longitudinal seating on one side. This photo was taken at night, with a flashgun, which explains why nothing can be seen out of the windows. Normally flashguns should not be used when photographing transports as it temporarily blinds the driver, creating a safety hazard. 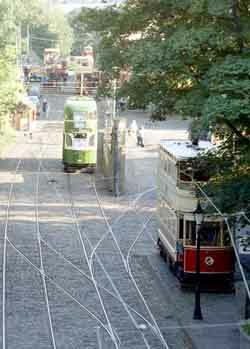 Manchester's Heaton Park is also the site of an operating tramway museum line. 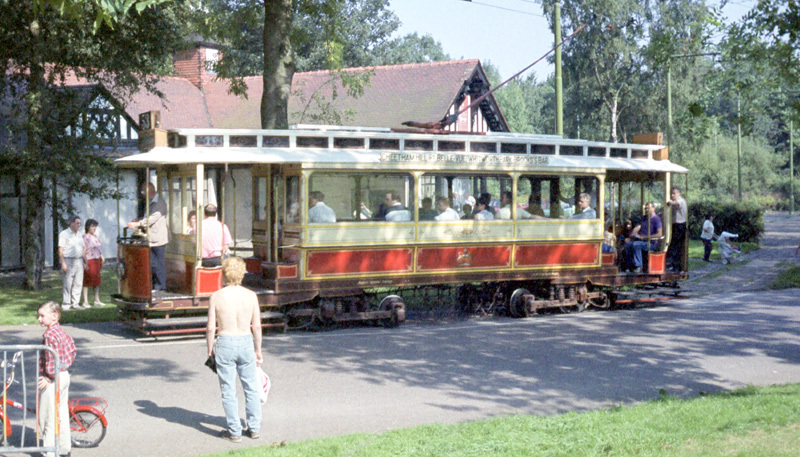 The city's first generation tram system included a short section of route which entered the Park at the Middleton Road entrance and ran towards the boating lake, and nowadays vintage trams use this line on Sundays and most Bank Holidays throughout spring and summer. School parties and private hire can be arranged on other days. Heaton Park is a large municipal park which forms the gardens of 18th Century Grade 1 listed Heaton Hall. Other attractions within Heaton Park include a boating lake, golf course, pitch and putt, horticultural centre, farm / animal centre, football pitches, bowling greens, play areas and gardens. 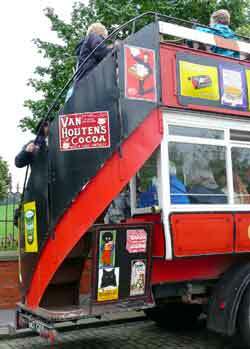 The Park also plays host to many events and fun fairs, including the Trans-Lancs Vintage Vehicle Rally, charity runs and open air concerts. 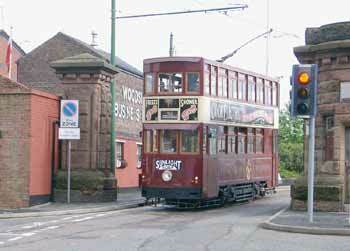 The Heaton Park tramway is entirely separate from the second generation Metrolink light rail system. However Heaton Park Station (which is on the route to Bury) is a short walk through the park from the lakeside terminus of the Heaton Park tramway. Manchester 765 is one of two surviving Manchester trams. It was originally built for use on the 53 which was a peripheral route that ran three-quarters of a circle around the City and passed under a large number of low bridges. 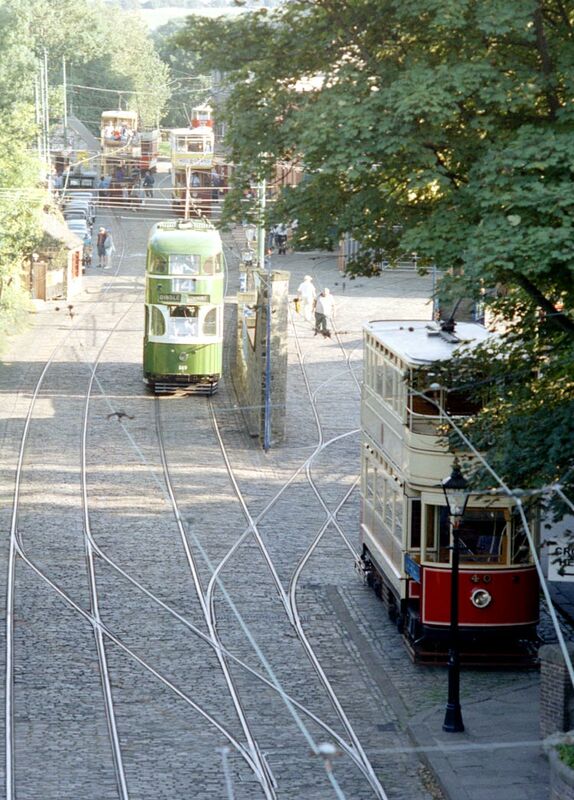 For many years following its withdrawal from service in the 1930's this tram was being used as a summerhouse, its restoration and return to service in 1980 also marked the reopening of this section of tramway. 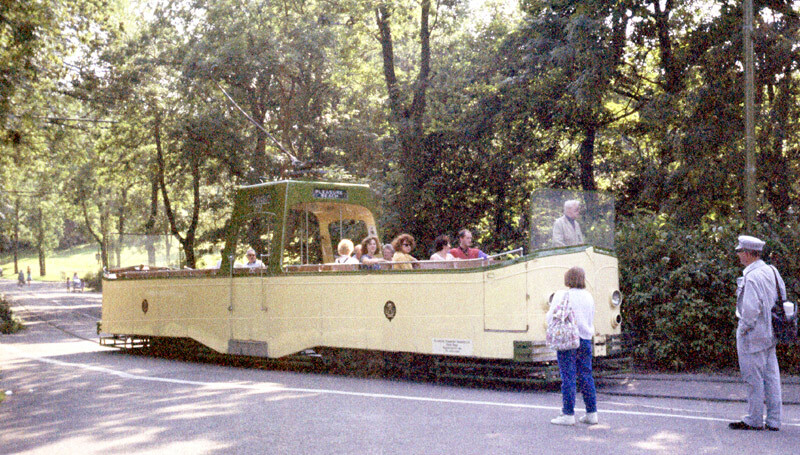 These views were taken using a 'stretch' or 'panoramic' camera on a visit in the 1990's, during the time-frame that the Heaton Park tramway had been loaned a Blackpool 'Boat' tram, as seen here. 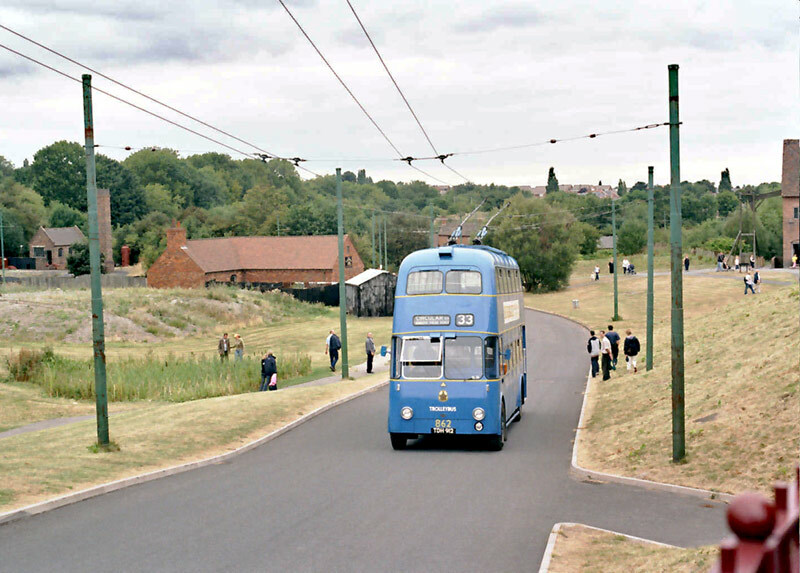 The East Anglia Transport Museum (left) and the Trolleybus Museum at Sandtoft (right) are looked at in greater detail on the Nostalgia page. For more information about these living museums visit their websites (all links open in new windows ). 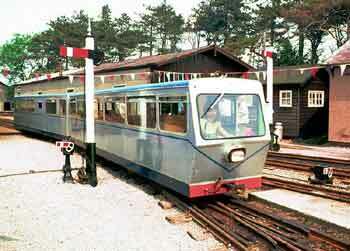 The East Anglia Transport Museum - http://www.eatransportmuseum.co.uk/. 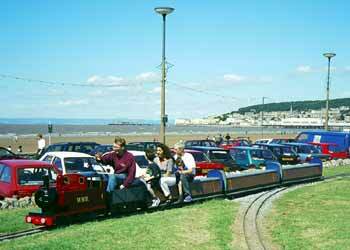 Another British leisure-themed tramway is the Seaton Electric Tramway in East Devon. Located in south-east Devon this line took over a former mainline railway branch along the River Axe estuary between Seaton Junction and the village of Seaton and now operates a fleet of 'smaller sized' trams which run on track that is just 2'9" (approx 84 cms) wide. Most of the route is single track, although there are several passing places. 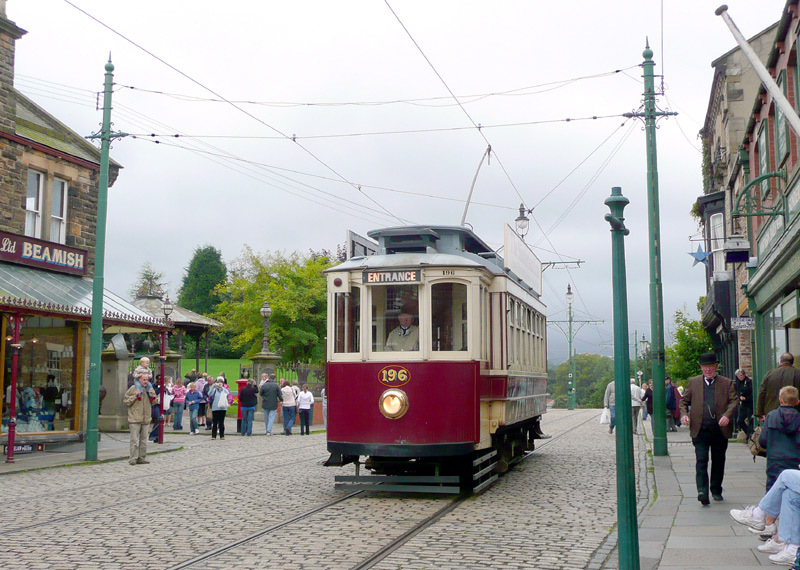 Some of the trams are relatively modern builds which have been styled to look somewhat like trams from various systems around Britain, whilst others are historic vehicles which have been modified to work on this tramway. The route passes through two nature reserves and in addition to being popular with tourists & visitors to the area special services are run so that ornithologists can enjoy their hobby too. With rising sea levels in mind it is to be hoped that the riverside nature of this tramway does not become the cause of its demise. Seaton Electric Tramway trams at the Edwardian-style Seaton Station, which is at the southern end of the line. 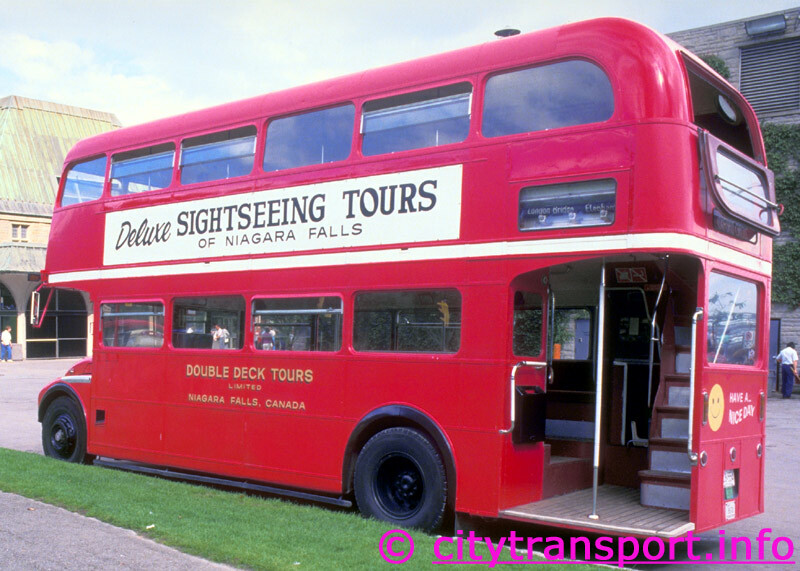 The open top tram on the right is at the alighting point for arriving passengers whilst departing passengers are boarding the red single decker seen outside the terminal building. 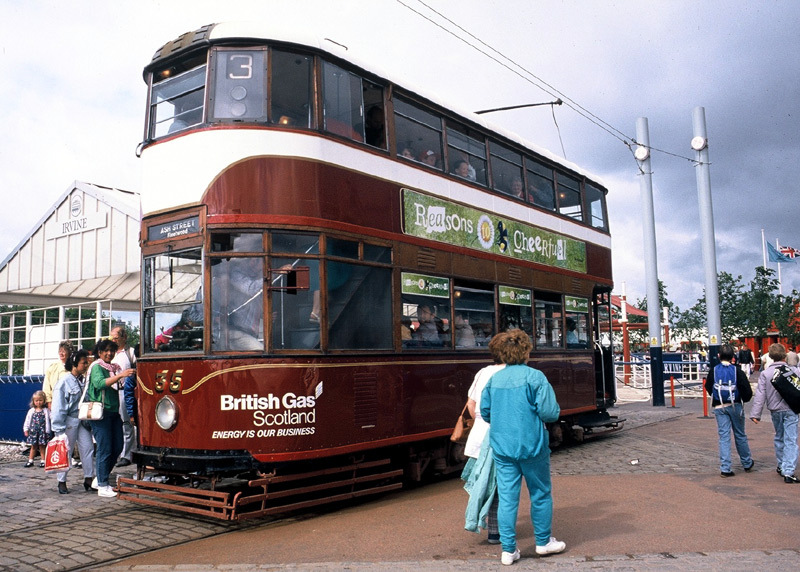 Tram №11 - seen here arriving at Seaton - is one of a number of trams which were designed in-house and include a wheelchair accessible centre section on the lower deck. 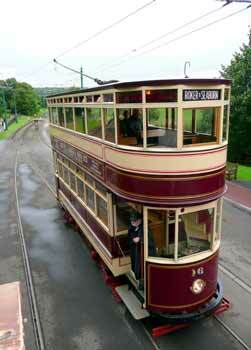 Built in 2005 these trams drew upon design elements from tramcars in Plymouth and Blackburn. 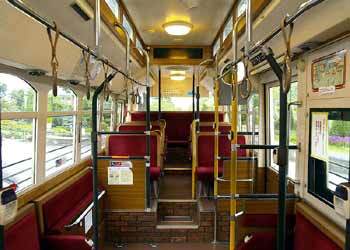 This specific tram is in an all-over livery of cream with gold lining which between 1914 and 1923 was used by seven Liverpool trams on a luxury '1st class' tram route. When the weather permits there is no finer way to travel than on the upper deck of an open top tram, however the fleet includes some fully-enclosed tramcars for those days when the weather is less favourable. 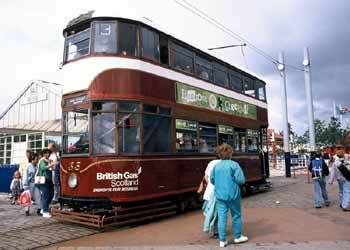 Tram №16 is former Bournemouth Tramways car 106 of 1921 which in 1992 was converted to a single deck saloon. These views show the end platforms with the driver's positions and very space restricted stairway (seen from off the tram and the top deck looking down). 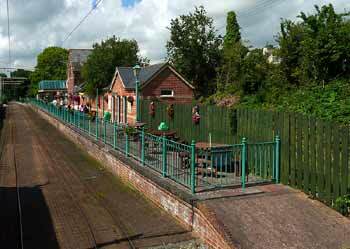 The northern terminus is at Colyton station, which is a former mainline railway station that was closed in 1966 and has now been adapted for use by the tramway. Facilities here include a retail shop which has a wide range of tram-related souvenirs and unique gifts to suit all budgets and the Tram Stop Restaurant, which offers an extensive menu of hot meals and snacks. Colyton town centre is a ten-minute walk away. Colyton features winding streets, pretty walks, enticing shops and amiable pubs which typify the unspoilt charm of an English rural town. The Seaton Tramway has one intermediate station, this being Colyford Junction in the village of Colyford. 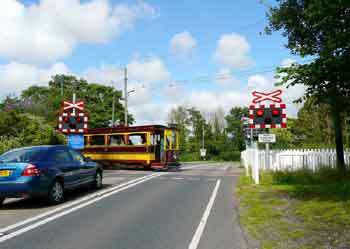 Next to this station there is a level crossing over a busy local road. The level crossing is protected by wig-wag flashing lights and an audible alert. It is activated on a 'by request' basis by the tram drivers. 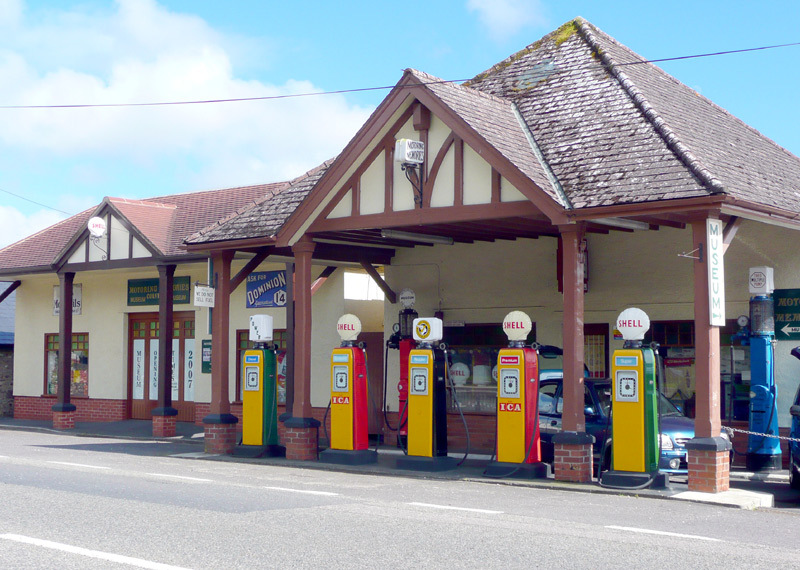 A short walk away from Colyford Junction used to be the Old Colyford Filling Station which was a former filling station that had been converted into a museum dedicated to motoring memories. TE Lawrence "of Arabia" was a regular customer here prior to his fatal motorcycle crash in 1935. Also near to the Seaton Tramway is the 'PECO' complex. Originally just the home of 'PECO' model railway products the site of the PECO factory has been transformed into one of Devon's leading leisure destinations. 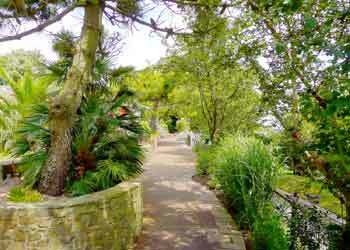 Other features of this family-friendly destination include separate safely surfaced adventure playgrounds for children of different ages, a secret garden, several theatres, an aviary, a maze, crazy golf, a picnic area, a fitness trail and more. In addition to the Pullman Dining Car which serves cream teas and homemade cakes there is a licensed restaurant which offers both children's meals and vegetarian dishes, with highchairs and baby changing facilities also available. In the summer the theatres host shows with clowns, jesters and magicians. 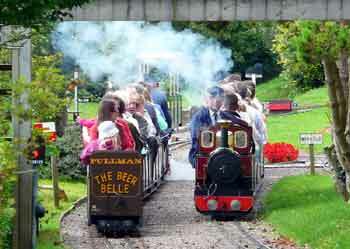 The Beer Heights Light Railway takes passengers on a delightful route around Pecorama. The journey includes travelling over bridges, along a deep cutting and through a tunnel - which goes under the car park. The indoor exhibition area is next to the main visitor entrance and a well stocked retail shop which sells both general souvenirs and railway related items. Clicking any of these Pecorama images or here will lead to a dedicated page showing more (and larger) images in a new window. 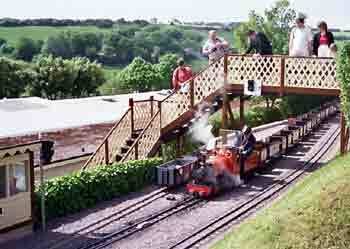 The Beer Heights Light Railway is over a mile in length and in addition to taking passengers around the main garden site passes over bridges, along a deep cutting and through a tunnel. White Falls Halt and photo point. The fully working signalling system features a mix of semaphore and colour light signals. The fleet includes seven steam engines, a battery electric tram and a diesel engine which is seen here awaiting its correct departure time at Much Natter station whilst working the last train of the day. 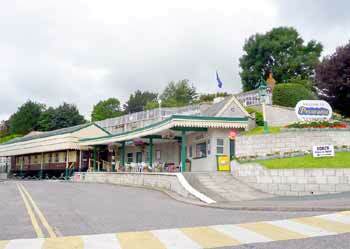 The Pullman Dining Car is under a platform style canopy at the far end of a stylised station platform. This is one of several locations at the PECO complex where visitors may partake of afternoon tea complete with scones and clotted cream - as well as a wide range of other delightful edibles (some people prefer chocolate cake!) 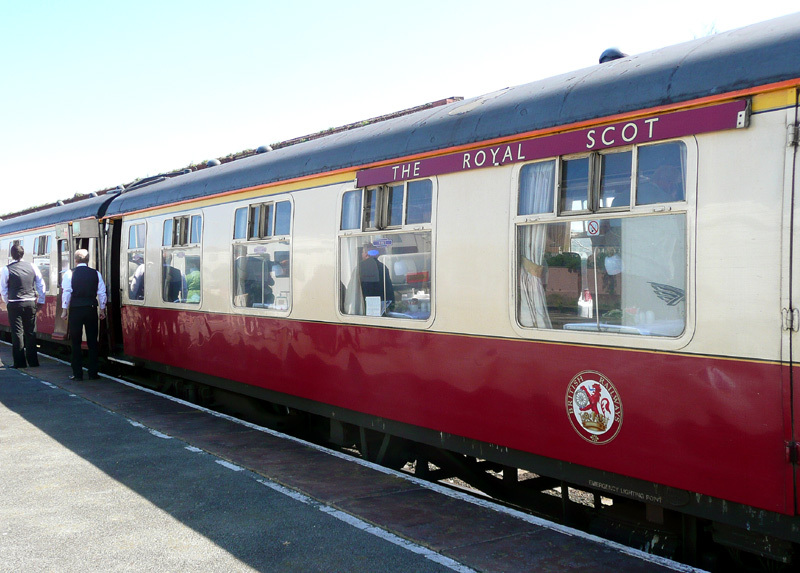 Some copies of railway posters can be seen through the window on the blank wall side of the Pullman carriage. Elsewhere more substantial meals are also available. This is the only photograph on this website of the exhibition area - to properly appreciate what is demonstrated here requires a personal visit. 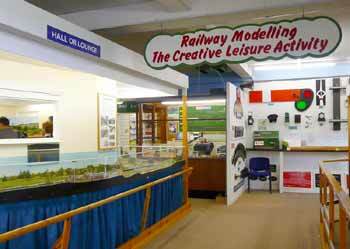 The indoor exhibition area is themed along the lines of promoting railway modelling, which it does by showing how a model railway could be incorporated in to many different room settings - including bedroom, converted loft, corridor / hallway, garden shed and more. 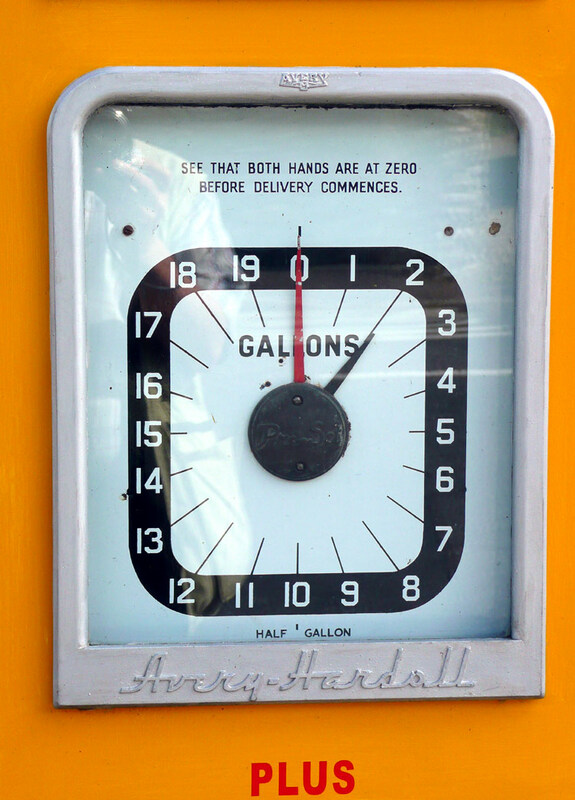 To increase attractiveness to the younger visitors many layouts have push-button controls. For people (of all ages) looking for more advanced inspiration and advice there are informative information displays on various aspects of creating a model railway, such as how to build the baseboard and lay model railway trackage so that it will give many years of trouble - free operation. Sometimes there is even an expert on hand to demonstrate some of the techniques involved in building model railway kits, especially of the locomotives / other items of rolling stock which are not available in 'ready to run' form. Railway modelling is much more than simply 'playing trains'. The acts of building the baseboard, installing scenery, wiring everything so that it works and building / super-detailing the model trains and the model buildings (which usually come in kit form that need building & sometimes painting too) makes railway modelling a creative activity through which young people can learn useful 'life skills', including working as a team, the basics of woodworking, electrics, an appreciation of building design, a general understanding of the interconnectedness of life, how things work, and so much more! 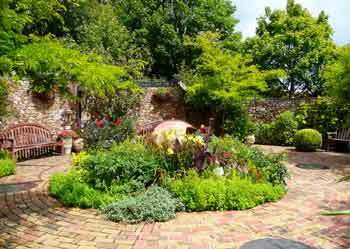 Pecorama also includes some highly acclaimed gardens which will be of interest to anyone who likes gardeners, even if they are not interested in railways. 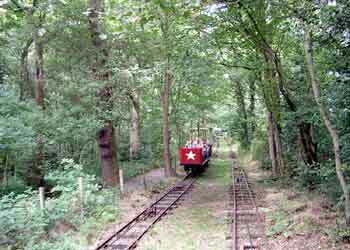 The Shipley Glen Cable Tramway is the oldest working cable tramway in Great Britain (cliff lifts excepted). Dating from 1895, the line was built to serve the local beauty spot of Shipley Glen near Saltaire (which is just to the north of the city of Bradford) in the county of West Yorkshire. 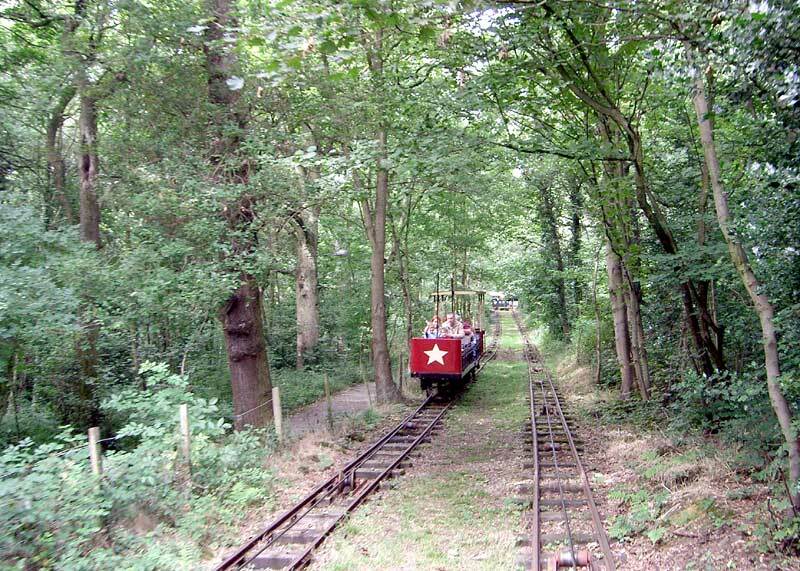 At nearly a quarter-mile (0.4km) in length, the woodland ride provides a pleasant alternative to a steep footpath. 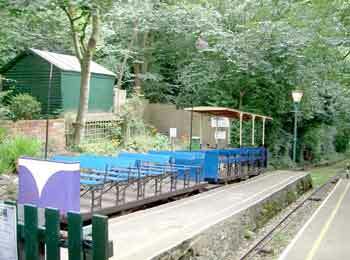 The line is about 10 - 15 minutes walk from Saltaire station . Directions on how to find it by car can be found on their website . These views of were taken on a busy Bank Holiday Monday, however as the intention is to look at transports - and not people - the image from the (lower) station was taken after all the arriving passengers had left the train, and before any departing passengers had joined it. 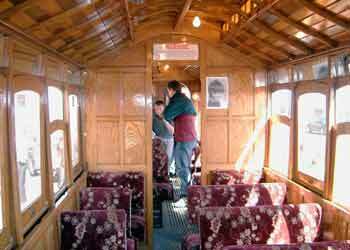 Trains consist of two carriages, one of which has a roof. This view of the upper station was taken using a 'stretch' or 'panoramic' camera on a visit in the 1990's. 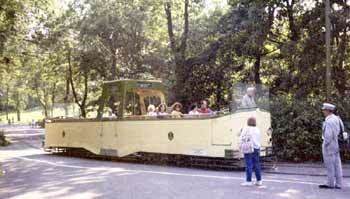 For more information visit their website at http://www.shipleyglentramway.co.uk/ . Naturally leisure extends to buses too - and indeed it is well known that when taken out of their daily routine people will do things they might not normally do - which includes choose to travel by motorbus! 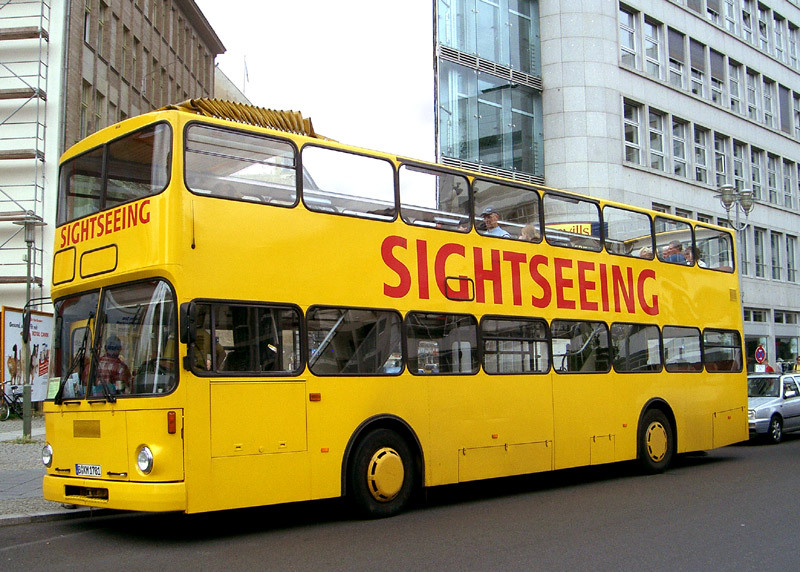 A good example of this is the popularity of specialist buses aimed at tourist-orientated sightseeing services. Especially popular are open-top variants - that is, when the weather permits!! 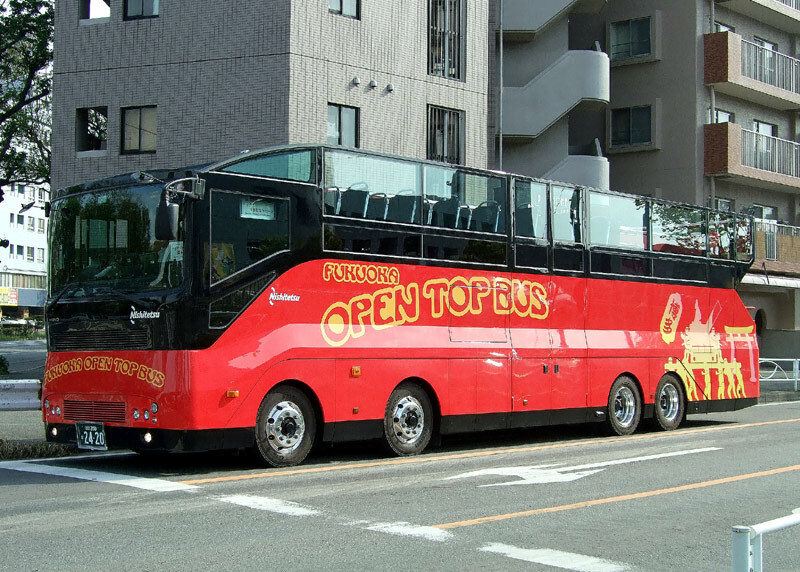 Open-top buses come in several variants - single or double deck and fully open, half open, or with roofs that can be closed when it rains. These latter options make them more suitable for year round use when the weather may not be very clement / or change suddenly. 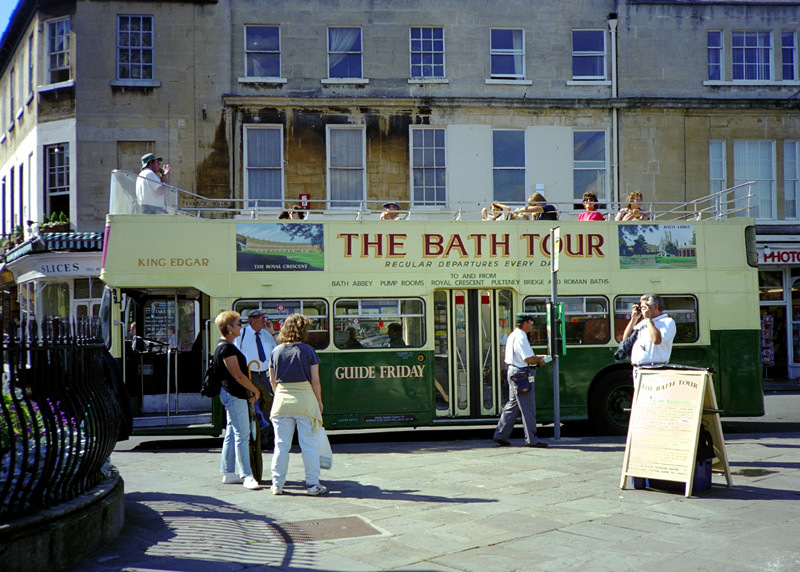 This view comes from Bath, a city which became so overrun with tourist buses that they had to be restricted by the local council. Judging by the activities of these tourists it seems that these buses are also good for the photographic industry. 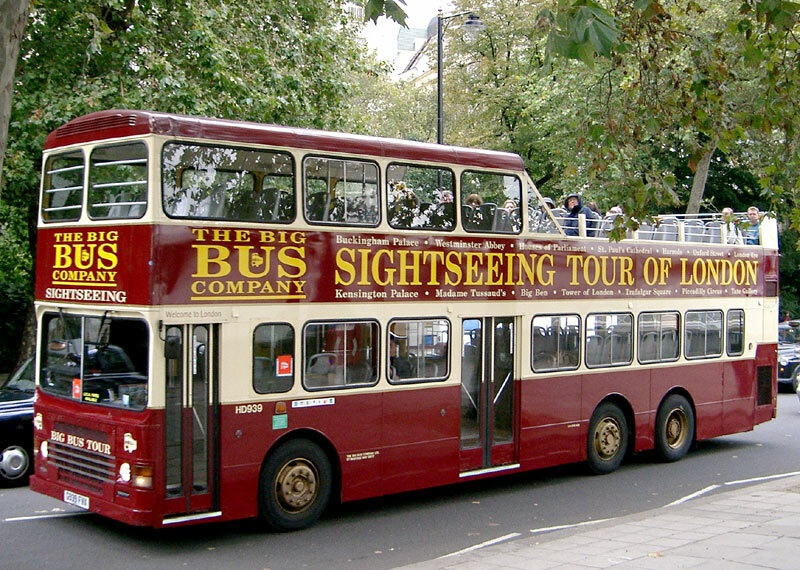 This view of a half open tourist bus comes from London where a range of independent bus companies provide tourist orientated circular bus tours. 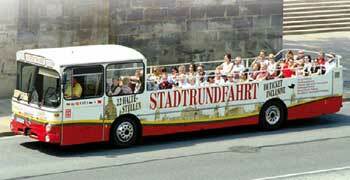 German open-top tourist buses - Berlin (left) and Dresden, (right). On the Berlin bus the folding roof can be seen in the open position at the front of the bus. Dresden image sourced from vehicle operator's publicity material. 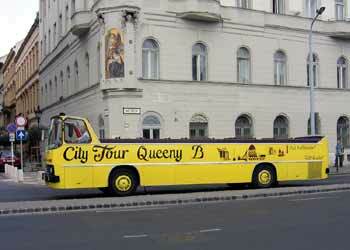 An open top single deck tourist bus in Budapest, Hungary. 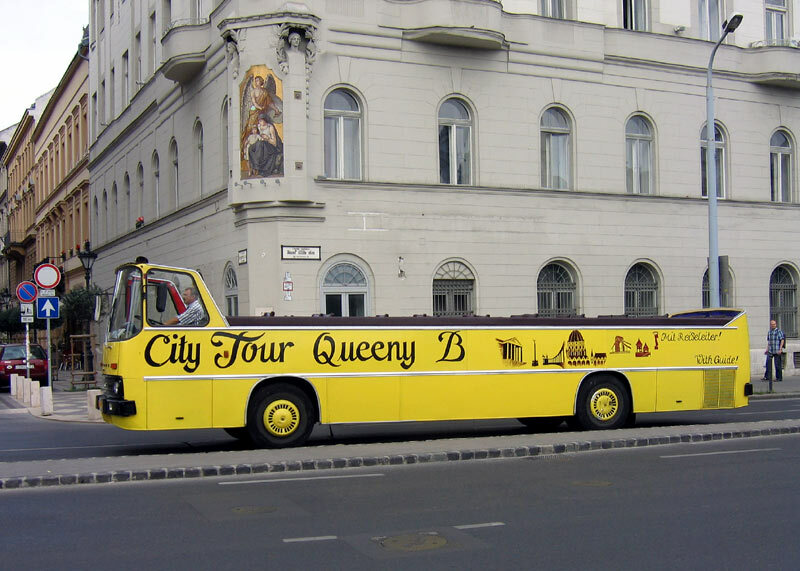 commons.wikimedia.org/wiki/Image:City_Tour_Bus_Budapest_084.jpg Fukuoka double deck open-top tourist bus. 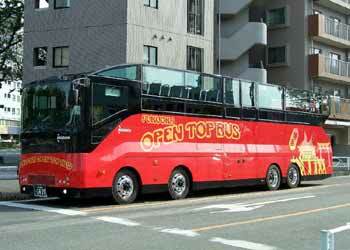 Despite not having a roof which can be closed the Fukuoka open-top double-deck bus seen above - right is an all-weather vehicle. When it is wet the 36 passengers are given complimentary raincoats! Although equipped with heating when the weather is cold passengers are lent blankets! Because of the open top there is no summer air cooling, instead passengers can benefit from the efforts of an innovative mist injection machine. For safety all passengers must remain seated and wearing the seatbelts during the journey - standing is strictly prohibited. For reasons of "accident prevention" children under the age of three are also prohibited. There is a lift for passengers who use wheelchairs. 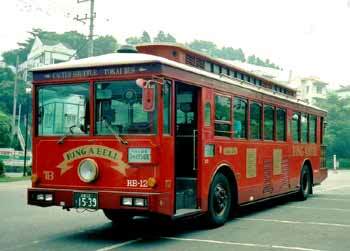 The bodywork of the Fukuoka open-top double-deck bus was built by a Japanese bus body builder which specialises in innovative bus body designs. Below are some more examples of its products, these images all come from this Wikipedia Commons page:- http://commons.wikimedia.org/wiki/Category:Tokyo_Special_Coach_Manufacture . Note the wheelchair symbol opposite the central doorway. 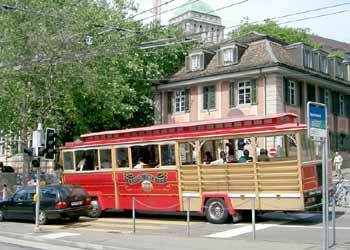 Aimed at the leisure industry this Zürich, Switzerland, motorbus has been designed to look something like a rubber-tyred version of a San Francisco cable car. Not being a "local transport public service" bus it was not allowed to use the bus / tram lane, so had to travel on the outside of the bus / tram stop. The real meets the pastiche! A real San Francisco Cable Car and a rubber tyred replica meet. This image was taken using a 'stretch' or 'panoramic' camera which explains the wide but narrow format. 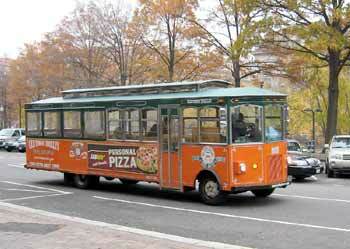 Another type of tourist bus is the Pseudo Vintage Trolley. 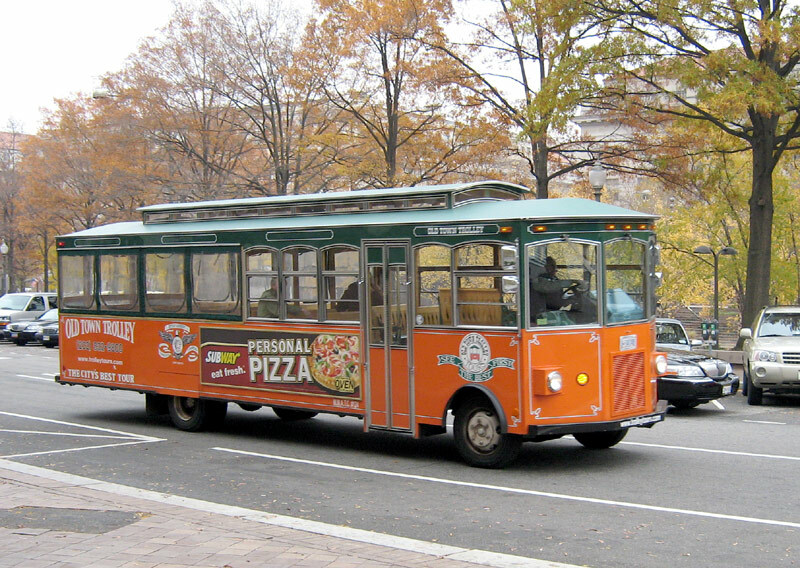 The reasoning behind this is that especially in North America many people look upon the old "trolley-cars" (ie: old-fashioned / historic tramcars or streetcars) with affection and as a result some leisure-orientated motorbus operators use vehicles which have been designed to look like rubber-tyred "trolley-cars". These are often called Tourist Trolley or the nickname of "trolleybus" - the latter being a name which causes no end of confusion with real electrically powered trolleybuses. 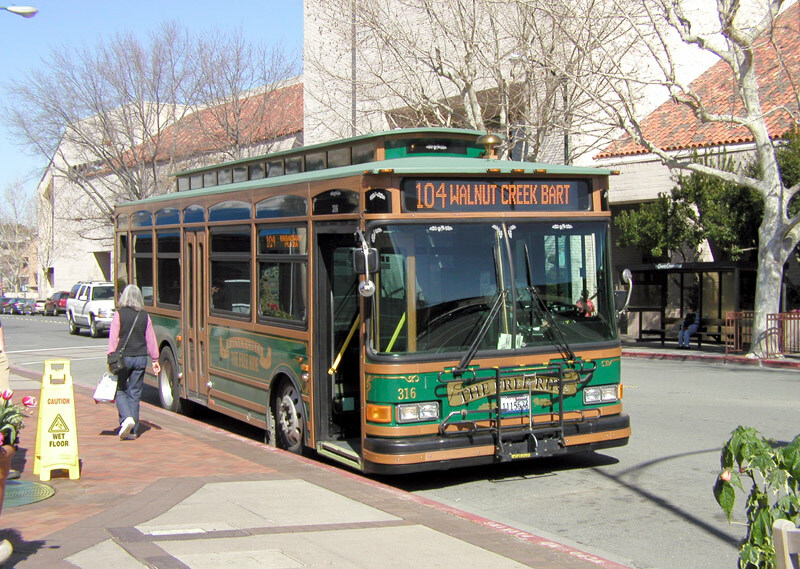 Central Contra Costa Transit Authority (CCCTA) 316 (Gillig Trolley Bus Replica) at Broadway Plaza, Walnut Creek, California. Image & license: Spicoli / Wikipedia encyclopædia. 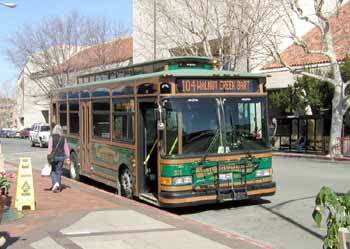 CC BY-SA 2.5 http://commons.wikimedia.org/wiki/Image:Walnut_Creek_Gillig_Trolley.JPG Tourist Bus, Washington DC, USA. In some locations withdrawn British double-deck buses have found second lives in the leisure industry. 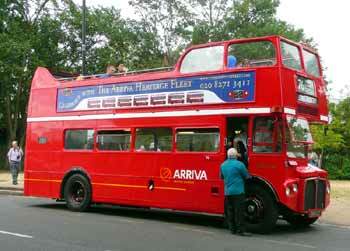 Whilst in many cases the passengers think that they are travelling on former London buses this is not always so. Not that it matters... as long as they come, spend their money and leave feeling relaxed, happy and reinvigorated. 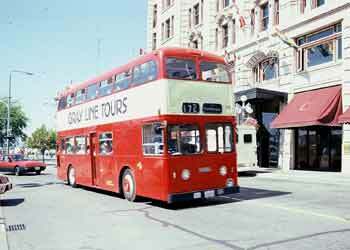 Vintage British double deck buses (which did NOT come from London) in Victoria, Vancouver Island, Canada, this being a location that is popular with North American (etc.,) tourists who want to sample a taste of "Ye Merry Olde Englande" without actually leaving North America. 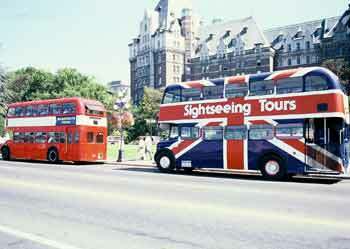 Some British buses (especially those from London) have found second lives on tourist services overseas. These examples were spotted in Ottawa, the Canadian capital (above left) and on the Canadian side at Niagra Falls (above right). 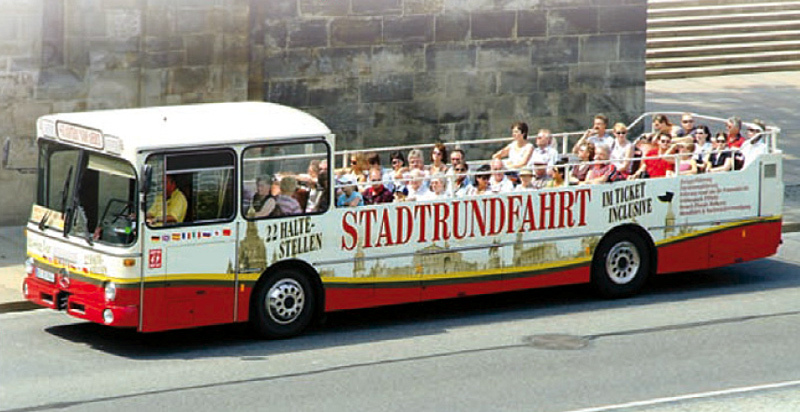 More examples of Routemaster buses in 20 countries overseas can be found by following this Wikipedia link http://commons.wikimedia.org/wiki/Category:AEC_Routemaster_buses_by_country . This is referred to as being pastiche nostalgia because it imitates something of nostalgic interest which is not actually how things really were / is not authentic nostalgia. 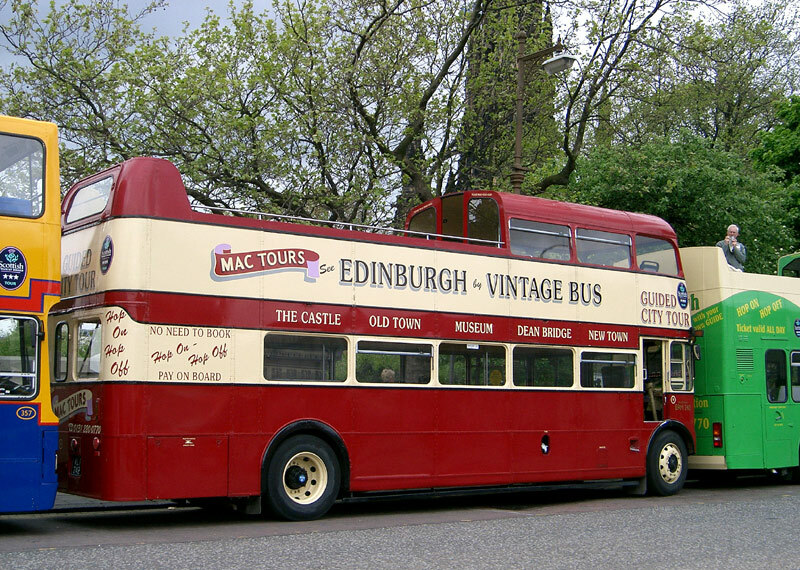 The Edinburgh bus seen below - left shows a Routemaster of type ERM. This variant was also not part of the original fleet but came about by a desire to increase the passenger capacity - especially on the upper deck. 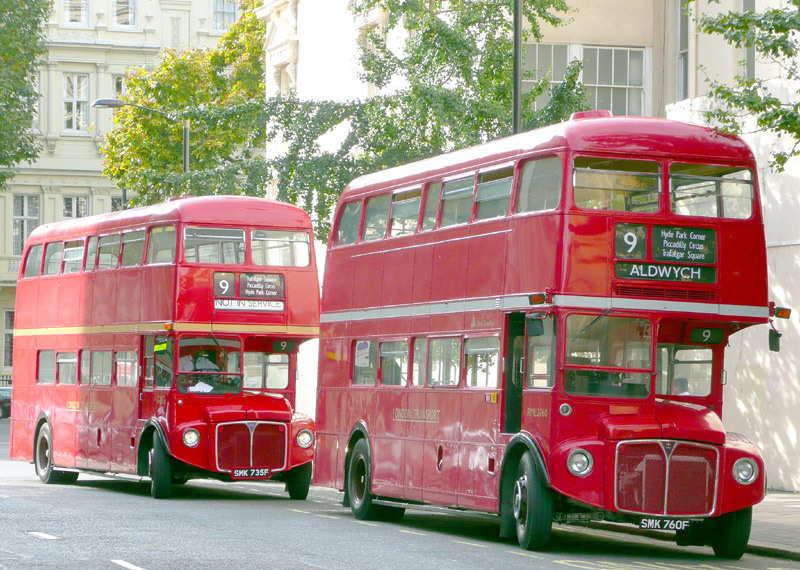 So advantage was taken of the Routemaster's modular design to extended some standard Routemaster buses by inserting a standard width bay to the middle of the bus so that they have five rather than the usual four full size windows per side. This added an extra eight seats to each deck. ERM 242 (registration No. VLT 242) in Edinburgh. 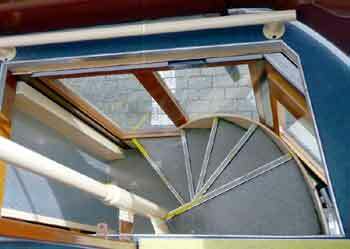 Spare parts from scrapped Routemaster buses have been used to partially rebuild the front part of the top deck; the covered area means that even in inclement weather passengers can enjoy a top deck view of the city without also getting soaked. 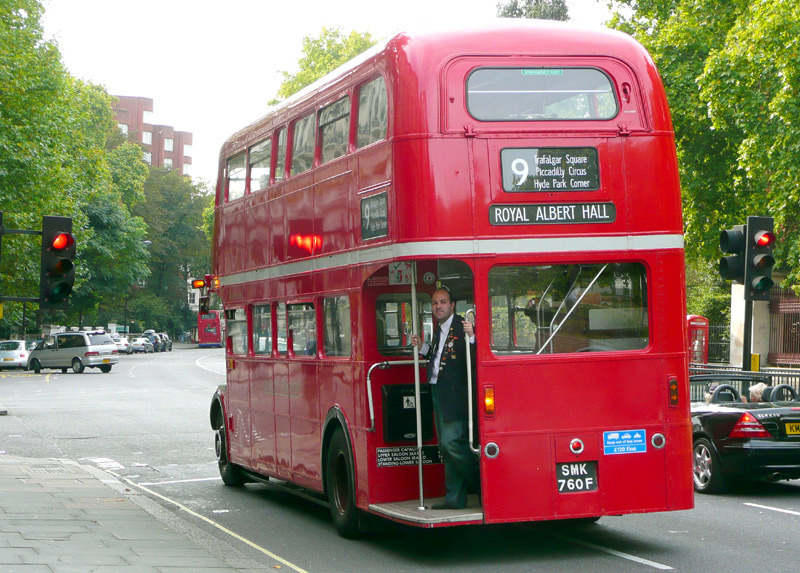 Routemaster buses were built in two different lengths and several variants, RMC 464 (registration No. 464 CLT) is a standard length vehicle that was built for Green Line express motor coach services. London still operates a few of the much loved Routemaster buses on special 'heritage' services. Originally this was over parts of two existing bus routes which serve areas that are popular with tourists but in July 2014 this was reduced to just one route, this being №15, where it has been found that the buses also meet a real transport need by providing passengers boarding near the Tower Of London with a service that always has available space. Also worth noting is that because these buses are in regular public service the fare for travelling on them is the same as all other regular service buses in London, although there is one subtle difference in that because of the different type of ticket machine used by the bus conductor it is not possible to accept fares paid using contactless bank credit and debit cards. 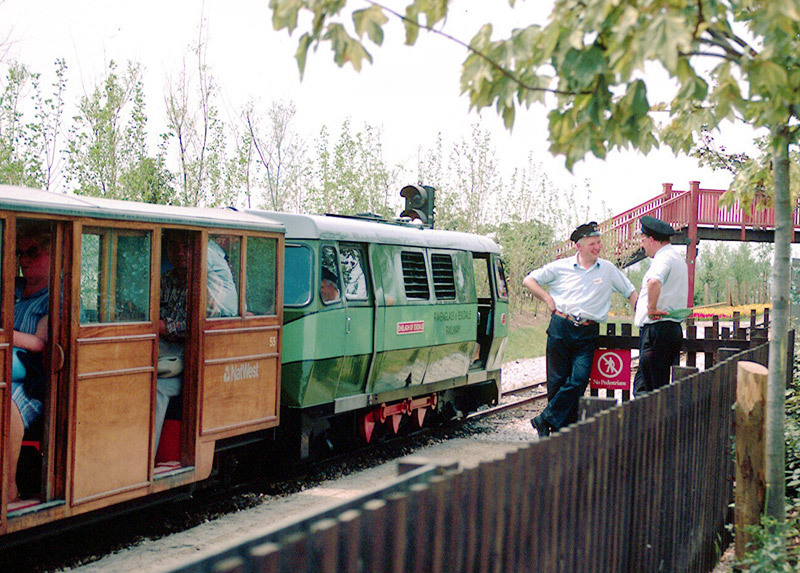 The rear vehicle in the image in the left is one of those which has been retained for the 'heritage' service whilst the front vehicle (a second view of which can be seen in the image on the right) is privately owned and is seen on a special 'running day' of such vehicles. It is in near original condition, which means that it still has the 'ear' type front trafficators and circular rear lights, including the centrally located single red stop lamp - which was all that the law required when it was built. 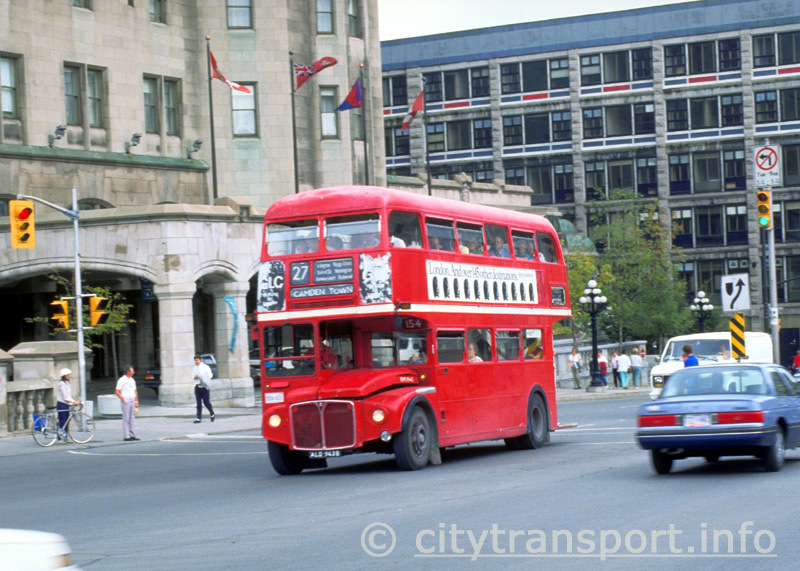 NB: both images here show these buses operating on route №9h; this is the service which ceased in July 2014. However they are still used on route №15h. 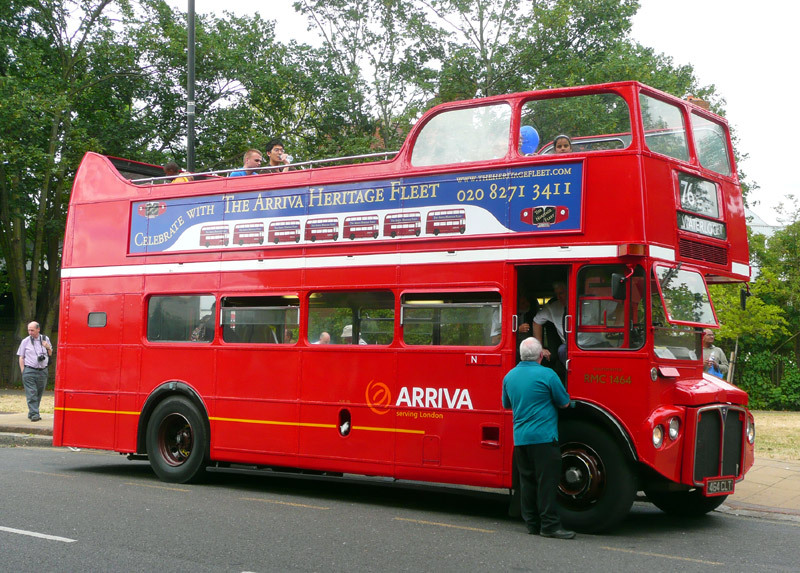 More information about Routemaster buses plus comparative views of the back of refurbished vehicles can be seen on the A Bus For London page and (when completed) on a dedicated page about these vehicles (link to come). The purpose and / or point of origin / destination of the journey. As a general guide, the one constant is that the vehicle must not be being used for hire and reward - which basically means that it must not be being used commercially with fare paying passengers. Apart from that for the vehicle to not need a tachograph then (in most circumstances) all the following conditions need to be met... *it is a vintage vehicle, *it is not carrying more than 9 people (including the driver) and that *it is being driven in a vintage vehicle rally or to / from such a rally, or to / from a museum or other place where the vehicle will be / has been displayed to members of the public, or to / from a place where the vehicle is to be / has been repaired, maintained or tested. Curiously, travelling to a filling station, or to / from a MOT vehicle testing facility (for its annual safety examination) does not meet this criteria - so technically it seems that a tachograph *might* be required when making these journeys. The term "vintage vehicle rally" is perhaps best understood to refer to an event in which a collection of historic vehicles are driven on the public highway along a pre-determined route. Sometimes vintage buses are used to re-enact bus services of yesteryear. It is usually understood that providing the vehicles are operating to timetabled services, complete with time cards detailing routes, timings, the drivers' rest periods, etc (ie: just like any normal scheduled urban bus service) then it is probable that tachographs will not be required. Apparently the regulations are somewhat fuzzy for this type of bus usage - it is almost as if the people who drafted the rules did not contemplate buses ever being used in this way! However, there are some other caveats and exemptions. For instance, when in 1991 new stricter driver licensing regulations were introduced a special restricted license became available to people who were able to prove that they had previously been driving vintage buses under the outgoing regulations. Known as a 'Grandfather rights' licence the holders are not subject to the '9 people including the driver' restriction. 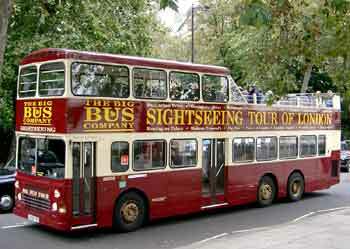 Another example is that buses which date from 1947 or earlier are not subject to the passenger number restriction. The use of Routemaster buses in London also benefits from some 'Grandfather rights'. Especially with respect of special-needs accessibility. This will be because they have been in continuous service since before present-day regulations were introduced. Had they been completely withdrawn and then reintroduced, and had the fare to travel on them been different than the fare charged on all other buses in London then the situation could have been very different. It also helps that they operate a portion of an existing bus route (ie: not a special route dedicated to them), as in this way passengers who require accessible transport are always able to make their journeys on regular low-floor accessible buses. The information contained here is for information purposes only, and should not be seen as a legally binding definition of the law. Potential vintage bus operators who are wise will make their own enquiries in a way which leaves a 'paper trail' as this is the only way to cover one's backside and prove that attempts have been made to learn about and then to follow the manifold and overly complicated minefield of regulations ... Below are some links to external websites which explore the situation more closely, plus a link to a page on the Wikipedia website which is dedicated to those who do not know what a tachograph is! To avoid being taken away from this page they all open in new windows. Some people who had a sales stand (selling books, videos, model trains / trams / buses & transport related ephemera) at The National Tramway Museum travelled there in an Ex-Bolton Corporation half cab motor bus, which both added to the 'period' theme, as well as providing a useful means of transport. 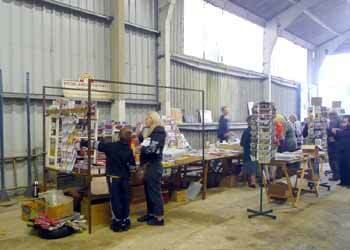 This sales stand was seen at the East Anglia Transport Museum but the general theme is the same everywhere. Note that the people browsing come from various sections of society - and are not just the often maligned anorak wearing middle-aged men. 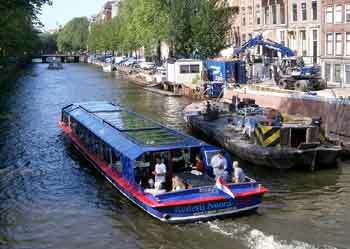 Another type of bus popular with tourists uses specialist vehicles known as the DUKW. Popularly called the DUCK, these are in fact six-wheel-drive amphibious trucks developed by the United States during World War II for transporting goods and troops over land and water and for use approaching and crossing beaches in amphibious attacks. The DUKW was used in landings in the Pacific, in North Africa, and on the D-Day beaches of Normandy. With the enemy holding all available ports, at Normandy alone DUKWs carried 18 million tons of supplies ashore in the 90 days after the landing. Although the designation DUKW may seem to be a military pun, under the terminology developed for military vehicles in World War II the D indicates a vehicle designed in 1942, the U meant "utility (amphibious)", the K indicated all-wheel drive and the W indicated two powered rear axles. The DUKW was actually built around a conventional six-wheel-drive military truck called the CCKW, with the addition of a watertight hull and a propeller. Nowadays DUKWs are still in use, however more happily they are primarily used as tourist transports in harbour and river cities such as London, Liverpool (UK); Dublin (Eire); Boston, Philadelphia, Pittsburgh, Baltimore, Wisconsin Dells, Seattle, (USA); and Halifax (Nova Scotia, Canada). For this almost all of them have been repainted, given modern diesel engines and enclosed tops, making them more resemble conventional buses. 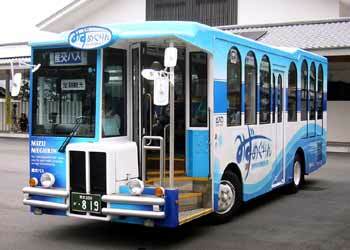 Most require a bus-type Public Service Vehicle license and a passenger-use boat license. 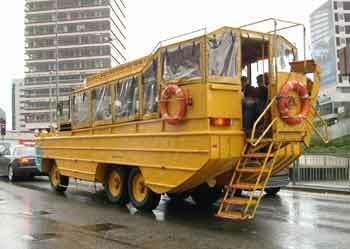 More information about - and illustrations of - DUKWs can be found on this Wikipedia encyclopædia web page: http://en.wikipedia.org/wiki/Duck_Tour . 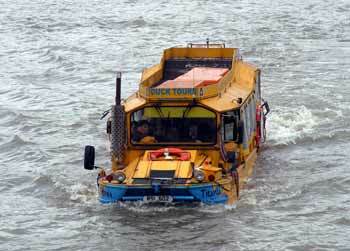 A Duck Tours DUKW seen on a "river" section of its tour in London, England. 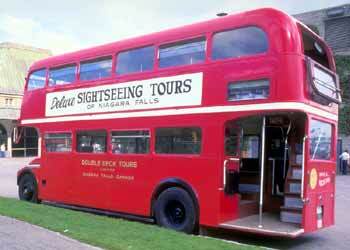 For more information visit the tour operators' website at http://www.londonducktours.co.uk/. http://en.wikipedia.org/wiki/Image:DUKW.Thames.Canthusus.jpg A Duck Tours DUKW seen on a "land" section of its tour in Liverpool, England. For more information visit the tour operators' website at http://theyellowduckmarine.co.uk/. More conventional leisure - orientated water transports exist too, although as with all the other forms of transport explored on this page leisure & nostalgia sometimes go hand in hand. 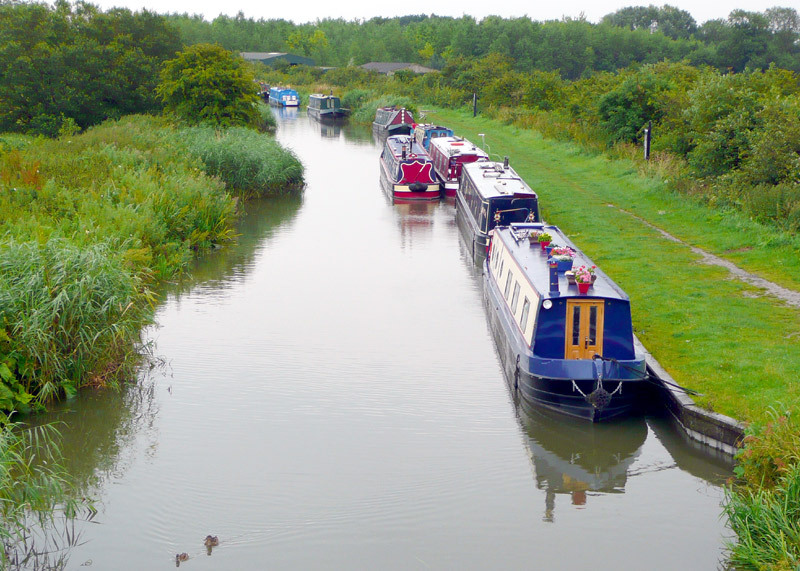 Before the age of the railway, rivers & canals were the best way to move freight inland. 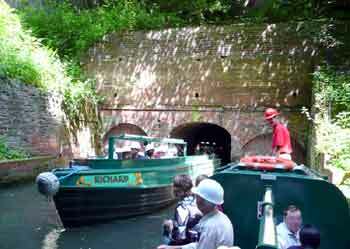 Nowadays the waterways are very much under-used, however while visiting the BCLM it is also possible to get a taste of what life on the waterways was like by taking a fascinating 45 minute ride through the Dudley Canal Tunnels and Limestone Mines on an electrically powered narrow boat. 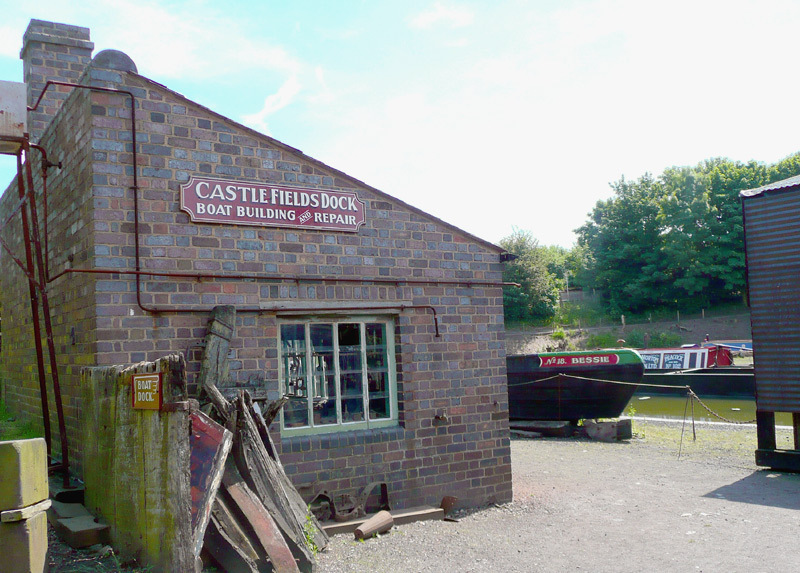 This is provided by the Dudley Canal Trust and is a separate visitor attraction which can be easily reached either via its own street entrance or via a direct access from the BCLM. The first of these narrow boats (named "Electra") entered service in 1976, since when three more such vehicles have been added to the fleet. 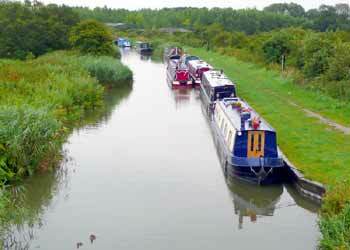 These full length steel passenger narrow boats carry over 50 passengers each. 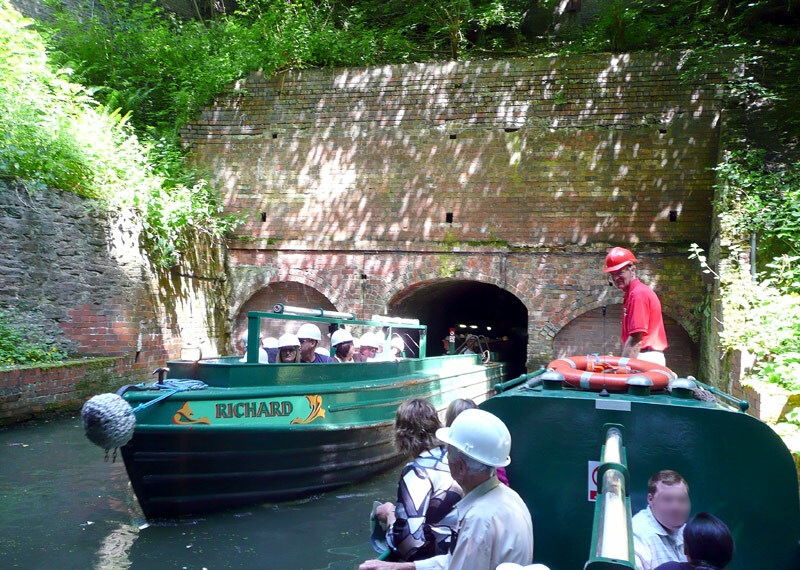 The tour includes travelling through original and two newly built canal tunnels, the latter date from 1986 & 1989 and are the first new British canal tunnels to have been constructed for 126 years. It is also possible to ride through the Dudley Canal Tunnels and Limestone Mines on electrically powered narrow boats. 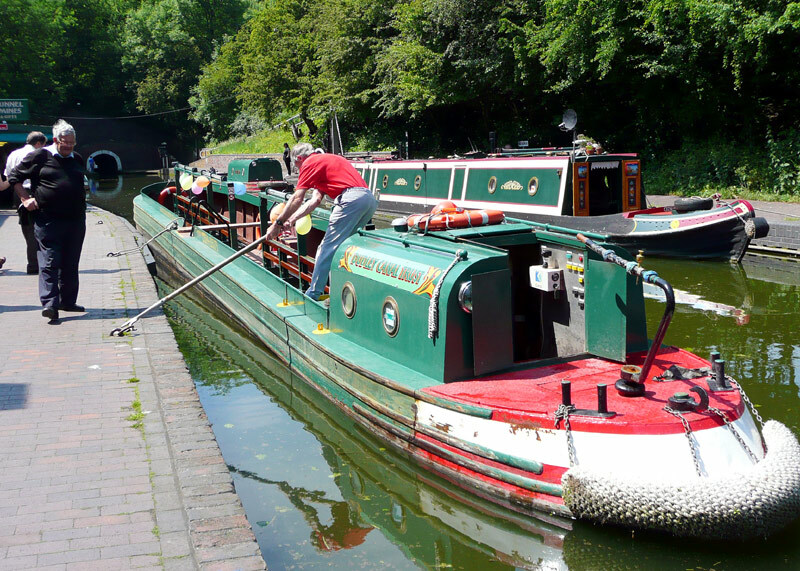 Boats are moored (aka: 'parked') at the water's edge by using a long pole with a hook at the end to latch onto metal rings fixed into the quayside and pull the boat towards the towpath. Boarding one of the narrow boats - the tour is enjoyed by people of all ages. The white arch in the background is the entrance to the canal tunnel. 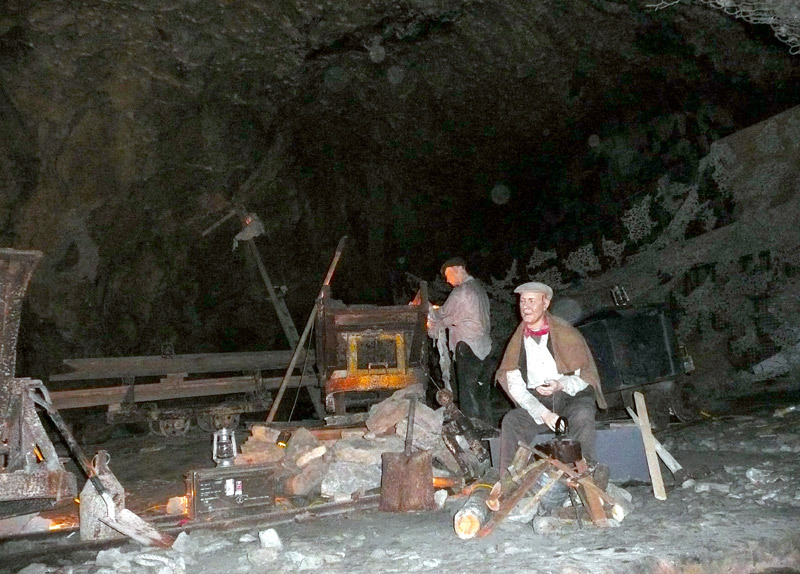 The tour includes passing some limestone mines - here wax models are used to depict a typical scene during the lunch break. Much more can be seen when on the tour than can be captured with a camera that has a low power flushgun. 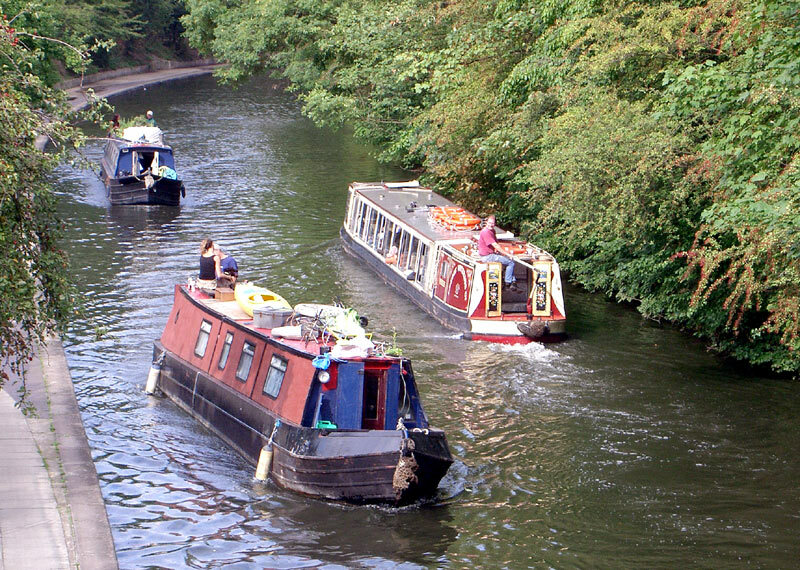 Two narrowboats pass. 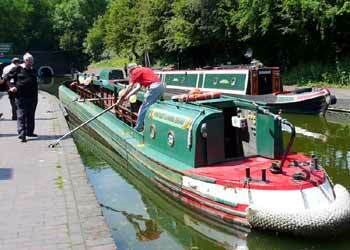 On a busy bank holiday afternoon as many as three narrowboats might be in service simultaneously. Although much of the tour is underground there are some open air sections too. 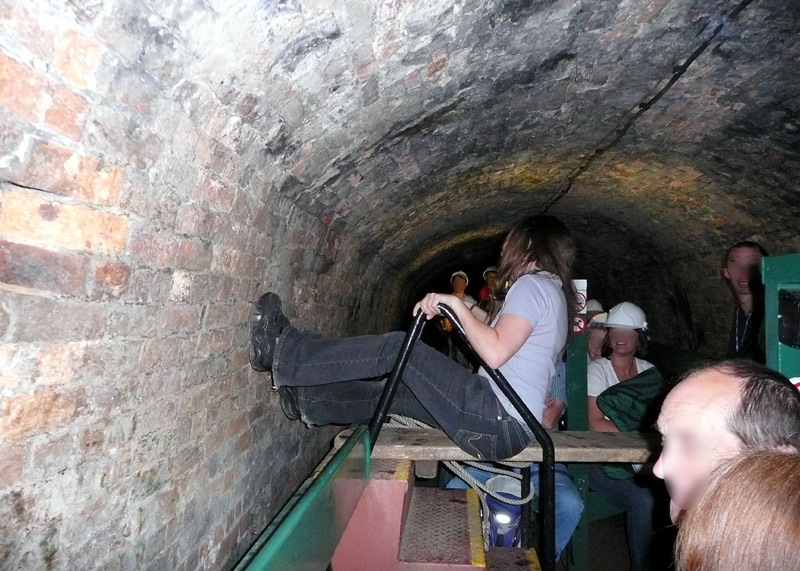 During the journey passengers can practise 'legging', which quite literally is propelling the narrow boat through the tunnels by sitting down (or, even better, laying on one's back) and walking on the inside of the tunnel. In 'ye olden days' this was necessary because the horses which pulled the boats along the canals could not be used underground. Of related interest will be the former canal workshop which is part of the adjacent BCLM. This dates from the days when Dudley was a very busy coal mining area and the canals were an essential transport facility used in the distribution of this coal elsewhere in Britain. The workshop built and repaired narrowboats, sometimes taking them out of the water and relocating them to quayside workshops. In many towns and cities the waterways are also often used to give tourists short rides to see the sights which they can enjoy as part of the 'visitor experience', in this way often complementing the road transports. 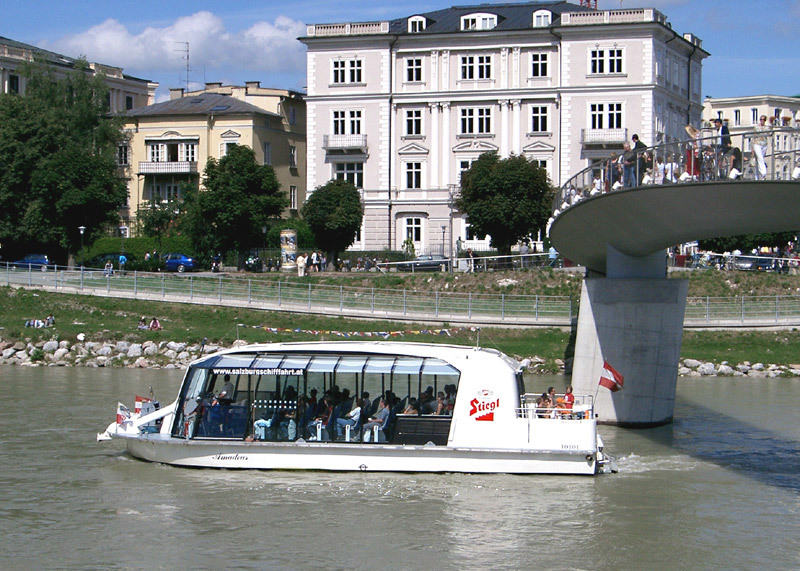 Pleasure craft on leisurely rides on a canal in Amsterdam, Holland (left) and the Salzach river in Salzburg, Austria (right). Houseboats on the Kennet & Avon Canal, near All Cannings, Wiltshire (an area which is famous for its crop 'circle' formations). Virtually abandoned after the railways took all the freight traffic this canal was reopened in 1990 and nowadays it is possible to hire residential narrowboats to spend a few days living on the water. 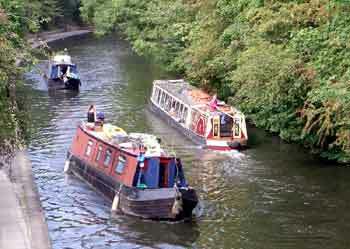 Two residential narrowboats (houseboats) (left) and a tourist tourboat (right) on the Regents Canal in London. 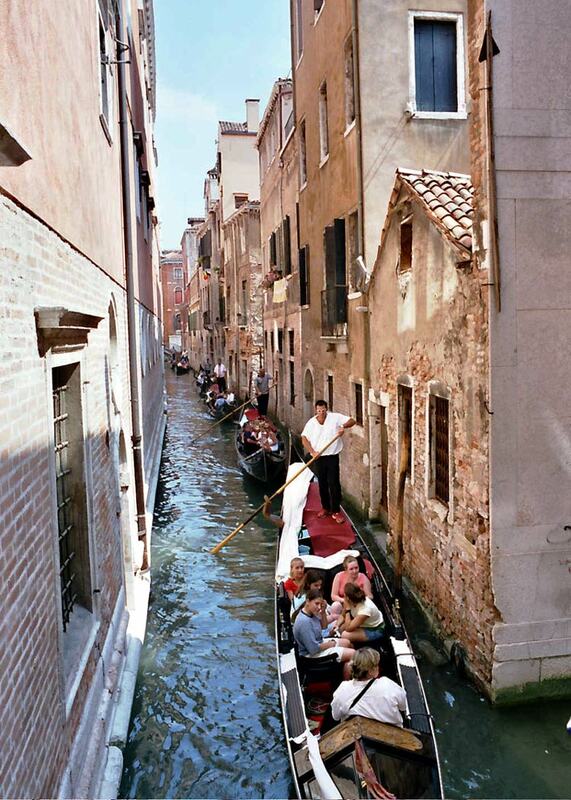 In the Italian city of Venice the water ways are used for both "serious" and "leisure" transport. 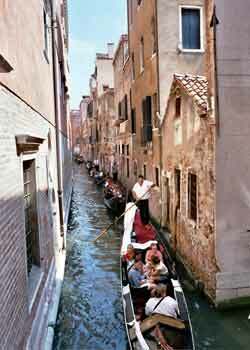 Gondalas such as these tend to be more leisure-orientated. 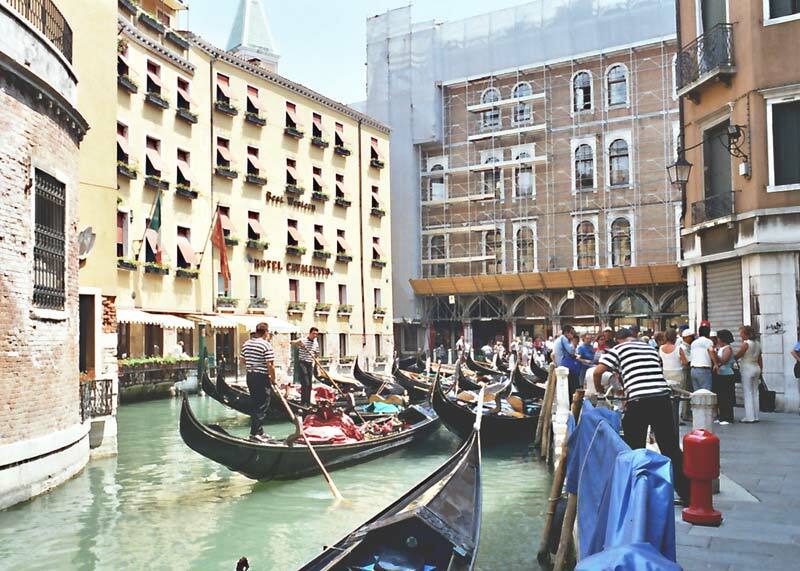 A short film from this visit to Venice in 2003 which includes these Gondolas as well as water buses (as "mainstream" urban public transport) has been placed on the ‘YouTube’ film / video website and can be watched at YouTube either on the right or (a version with a larger image) by clicking the link below. Flüelen is a small town on the shore of Lake Lucerne in Switzerland. These views show boats at and arriving at the quayside. The boat seen on the left is named Europa. The boat seen on the right is a paddle steamer named "Uri". The "William Tell" sign is because this is where passengers arrive after a cruise from Lucerne before taking a train over the Alps. (see below). According to the legends Wilhelm (William) Tell was a Swiss National Hero of Liberty who led his country against Austria. Apparently, Gessler (the Austrian governor) had ordered Tell to shoot at an apple placed on his son's head, a feat which was safely accomplished at the first attempt, knocking it to the ground. However when Tell informed the governor that had the boy been killed in the stunt his next arrow would have been aimed to kill him, the enraged governor threw Tell into prison. Eventually though Tell was freed after which he ambushed and killed the governor and initiated an uprising which the legends say led to national independence. Despite the uncertainty whether William Tell actually lived at all the legend has been very influential on the history of Switzerland and other countries. Nowadays what is believed to be William Tell's picture can be seen on the back of the 5 Swiss Franc coin, this being the largest coin in the Swiss currency. 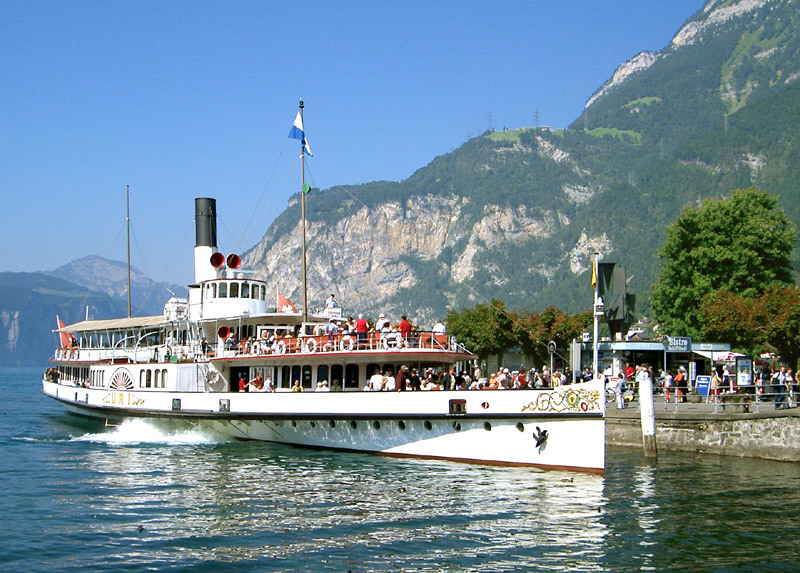 William Tell is also the marketing name for a leisure orientated transport experience that (between May and October) combines a paddle-steamer ride from the City of Lucerne to Flüelen (during which a gourmet meal is served) with a ride in an air-conditioned train to Locarno or Lugano in Italian-speaking southern Switzerland via the Gotthard Rail pass and the Swiss Alps. 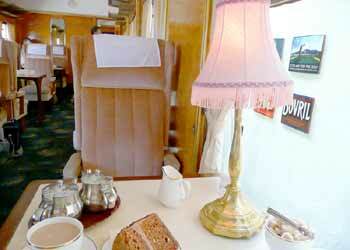 Whilst on the train passengers travelling first class will travel in panoramic passenger carriages. 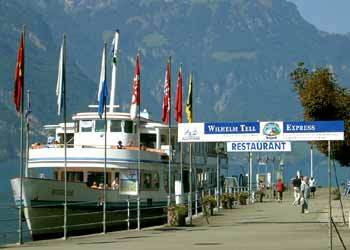 An Internet search also found several Swiss themed restaurants named "William Tell" in locations as diverse as Bangkok, Thailand and Vancouver. Canada. 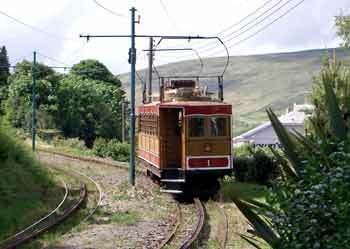 The Isle of Man railway system was originally built for 'serious' use and although much of the network was eventually closed some lines still remain. 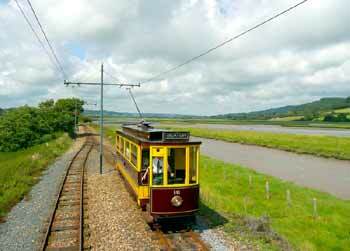 These include the two electric railways and one non-electrified line which uses steam trains. 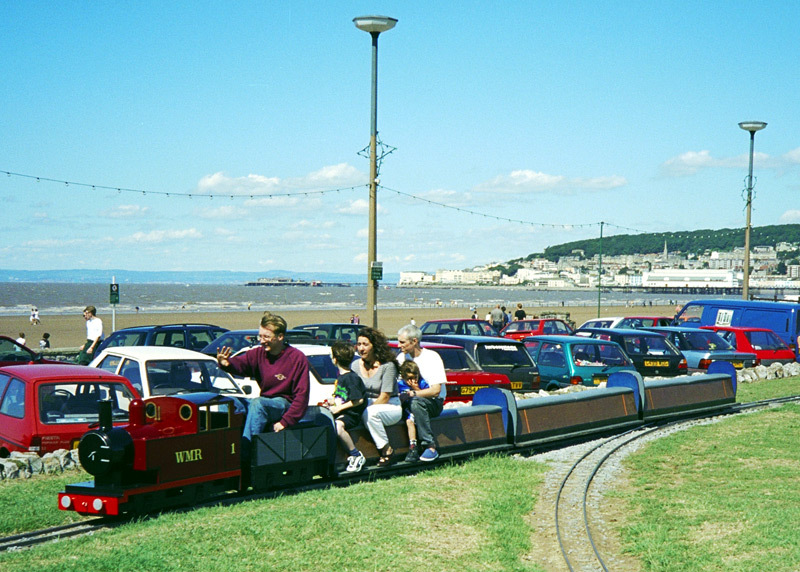 Steam trains are also used on the Groudle Glenn Railway which was reopened in the 1980's, plus there is also a horse tramway which plies along the seafront in Douglas, the island's capital. With modern buses providing the backbone of the island's public transport network all the transports mentioned here are now tourist-orientated and only operate in the summer months. At 15½ miles (just under 25km) the steam railway is the longest narrow gauge (3' - about 91cm) steam line in Britain; however because this page also visits other steam railways neither it nor the Groudle Glen Railway are illustrated here. 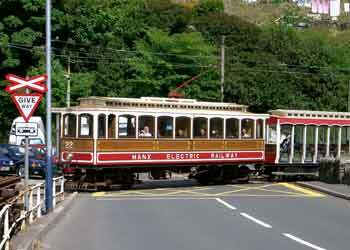 This line opened in 1893, being the first overhead wire powered electric railway 'anywhere' globally. 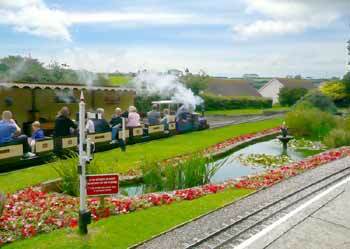 At 17¾ miles (28.5km) in length it is still Britain's longest narrow gauge (3' - about 91cm) vintage railway. Most of the route is along the coastline, twisting around tight curves and climbing steep gradients as mile upon mile of beautiful scenery drift by. This pioneer inter-urban railway still uses its original rolling stock which dates from the Victorian and Edwardian eras with the original two tramcars now being included in the Guinness Book of Records as being the world's oldest regularly operating tramcars. 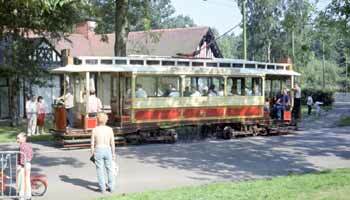 Opening in 1895 this narrow gauge (3' 6" - 106cm) line also uses its original tramcars. Because of the steep gradients (as steep as 1 in 12) the line was equipped with the centre "Fell" rail to provide braking assistance. 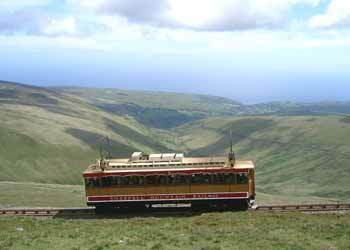 This is the only electric mountain railway in the British Isles. 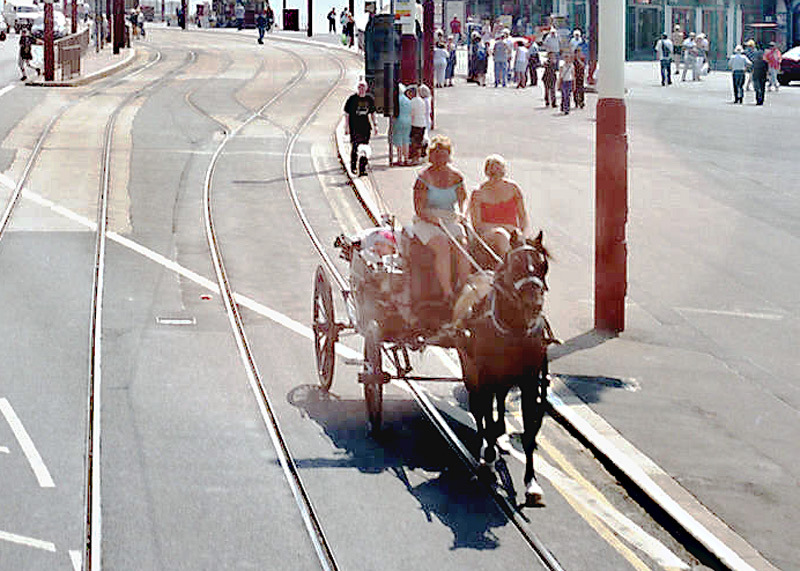 Running for nearly 2 miles (3.2km) along Douglas Promenade linking the Sea Terminal with the Manx Electric Railway terminus at Derby Castle this is the oldest surviving horse tramway anywhere globally. 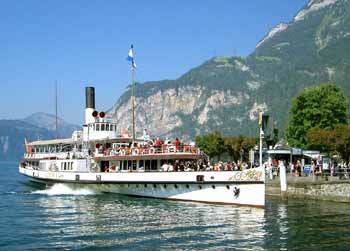 It opened in 1876 since when it has operated continuously (apart from war-time breaks). 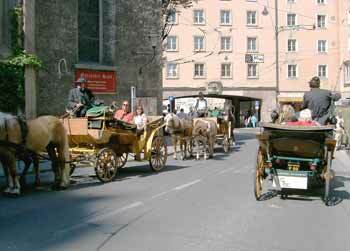 In all there are 42 horses which pull 23 tramcars (one at a time!) which are fitted with roller bearings to ease the load. 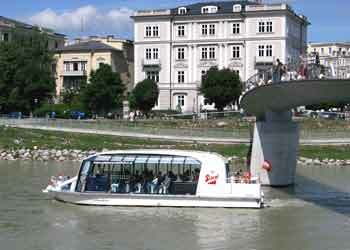 The tramcars are of various designs including open & fully enclosed which are used according to the prevailing weather. The horses are bred specifically for the service and as the image (above right) showing them being given a drink of water after having arrived at the Derby Castle terminus suggests, they are very well looked after. On reaching retirement they end their days at a Home of Rest for Old Horses (which also welcomes human visitors) in the nearby countryside. http://www.iom-horseshome.com/ . 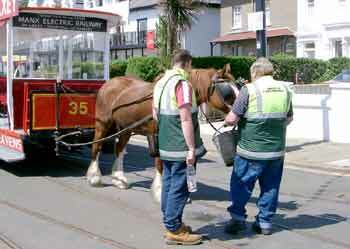 NB: As part of a project which includes refurbishment of the promenade and relocation of the tram tracks away from street traffic it is possible that the horse trams will not be operating during the 2015 summer season. 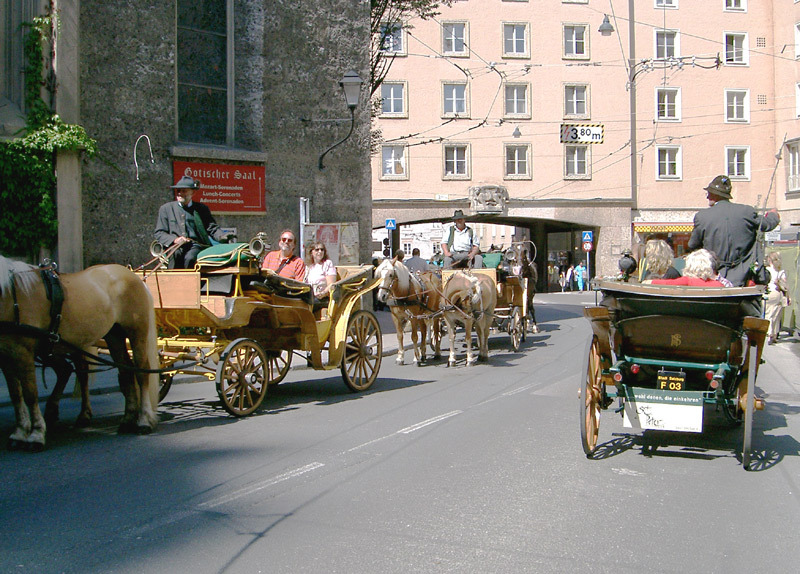 The Austrian city of Salzburg is popular with tourists - and at times it seems in danger of becoming over-run with horse powered buggies. With apologies to the nags on the left whose heads were left out of the photograph - they were in the shade and totally invisible through my camera's optics. 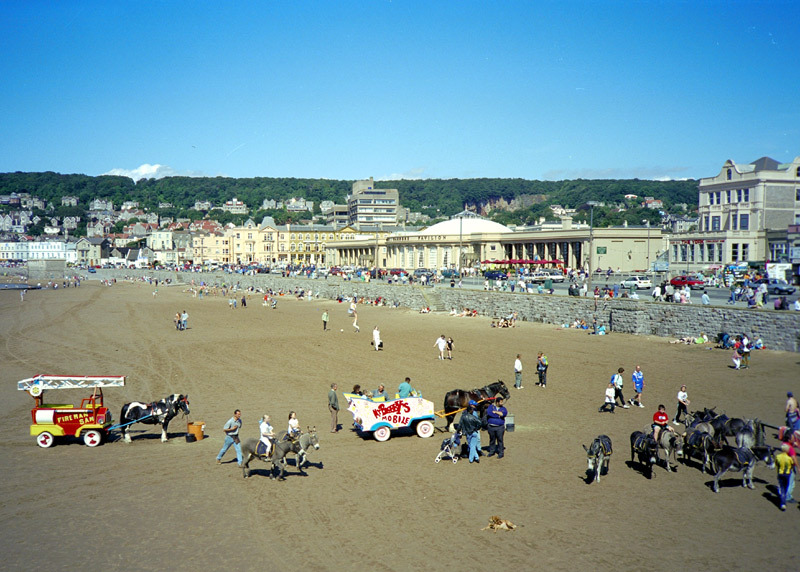 Horse powered transports are often to be found at seaside resorts as well as inland towns and cities which are popular on the tourist "trail". 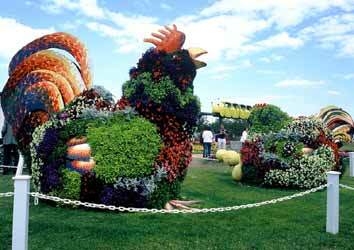 They are also popular with people who want organic fertiliser for their gardens. 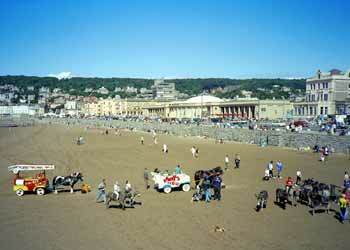 Donkey and pony & trap transports at the British seaside resorts of Weston-Super-Mare left and Blackpool right.